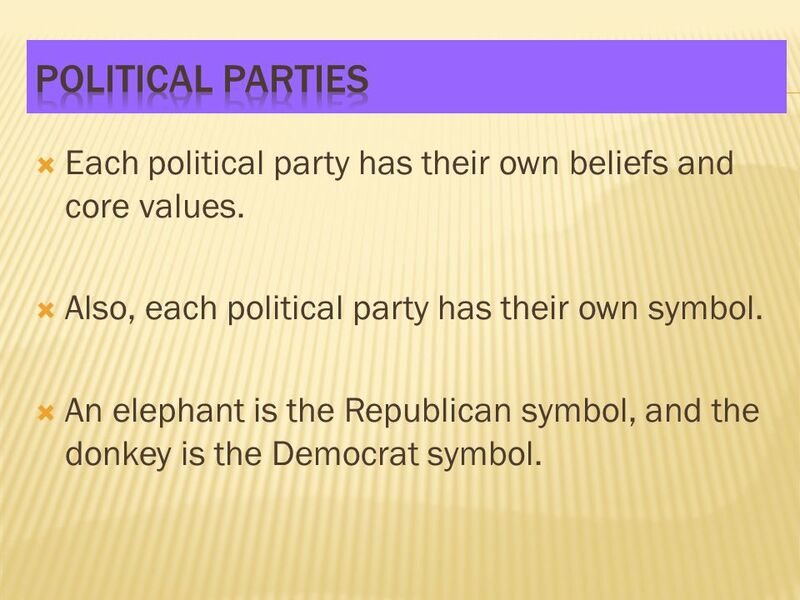 3 Political Parties Each political party has their own beliefs and core values. Also, each political party has their own symbol. 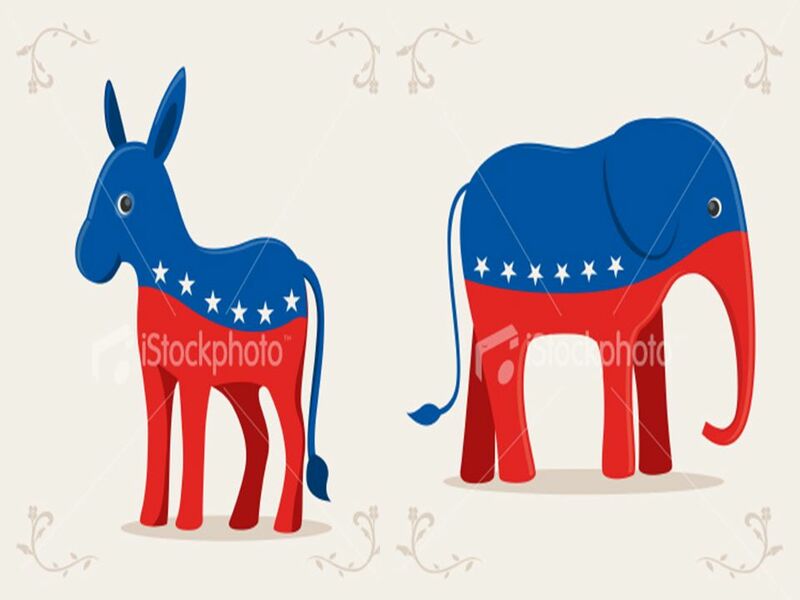 An elephant is the Republican symbol, and the donkey is the Democrat symbol. 5 Political Parties The donkey for Democrats came from the 1828 election and critics of Andrew Jackson . 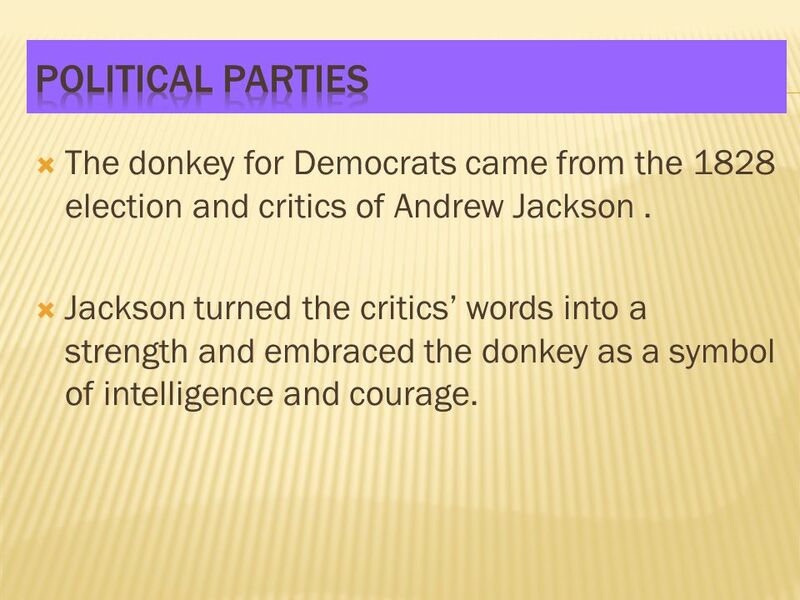 Jackson turned the critics’ words into a strength and embraced the donkey as a symbol of intelligence and courage. 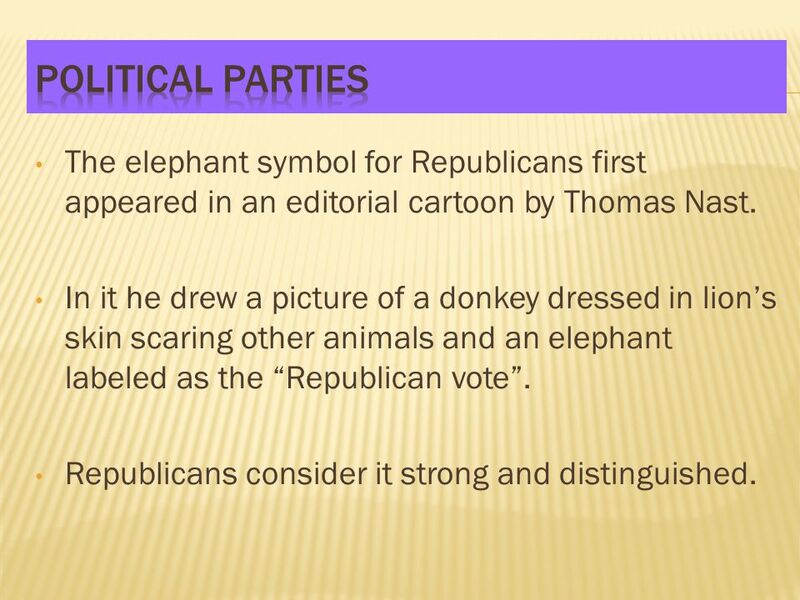 6 Political Parties The elephant symbol for Republicans first appeared in an editorial cartoon by Thomas Nast. In it he drew a picture of a donkey dressed in lion’s skin scaring other animals and an elephant labeled as the “Republican vote”. Republicans consider it strong and distinguished. 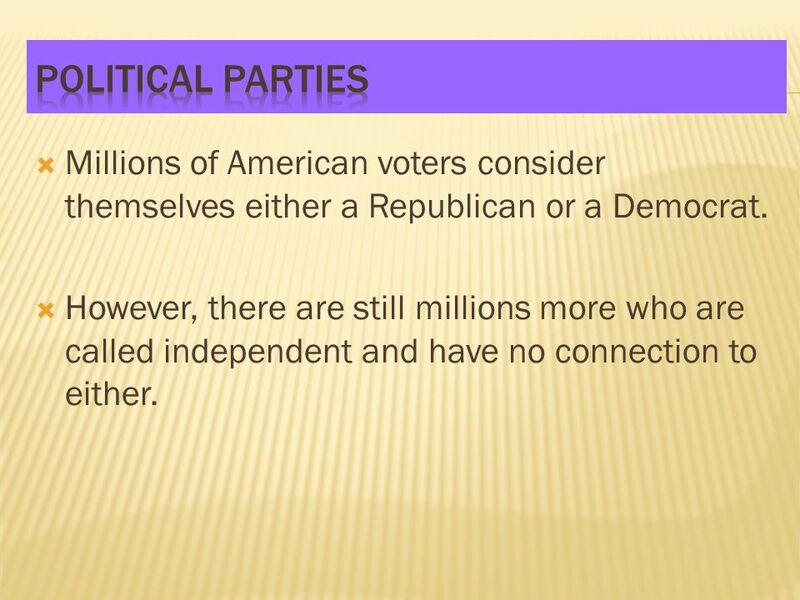 7 Political Parties Millions of American voters consider themselves either a Republican or a Democrat. However, there are still millions more who are called independent and have no connection to either. 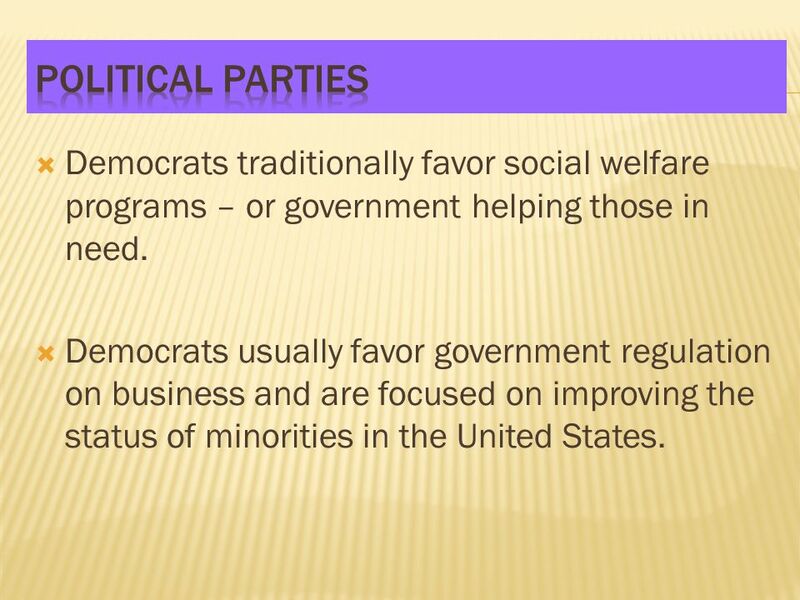 8 Political Parties Democrats traditionally favor social welfare programs – or government helping those in need. Democrats usually favor government regulation on business and are focused on improving the status of minorities in the United States. 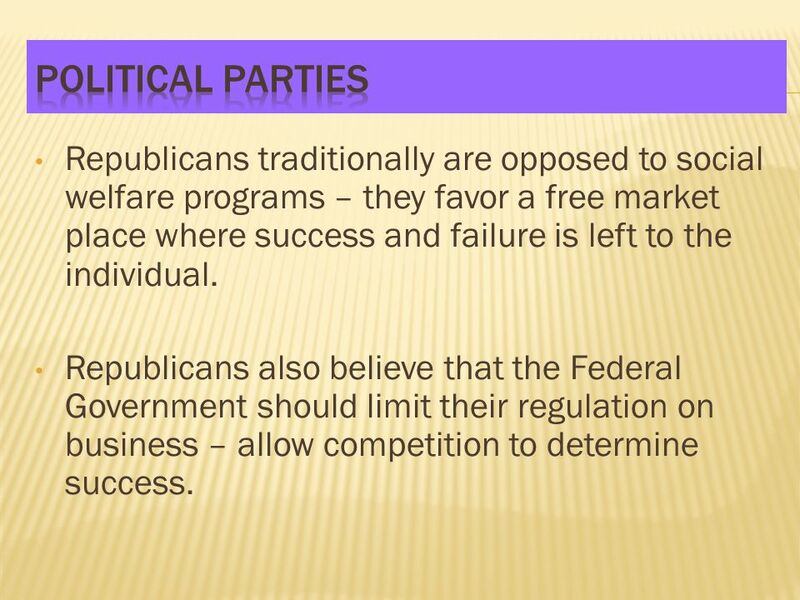 9 Political Parties Republicans traditionally are opposed to social welfare programs – they favor a free market place where success and failure is left to the individual. Republicans also believe that the Federal Government should limit their regulation on business – allow competition to determine success. 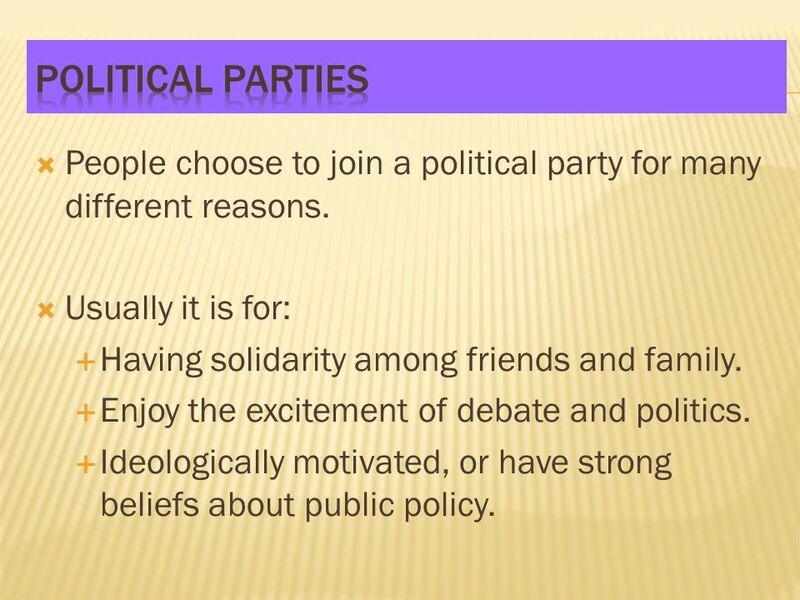 10 Political Parties People choose to join a political party for many different reasons. Usually it is for: Having solidarity among friends and family. Enjoy the excitement of debate and politics. Ideologically motivated, or have strong beliefs about public policy. 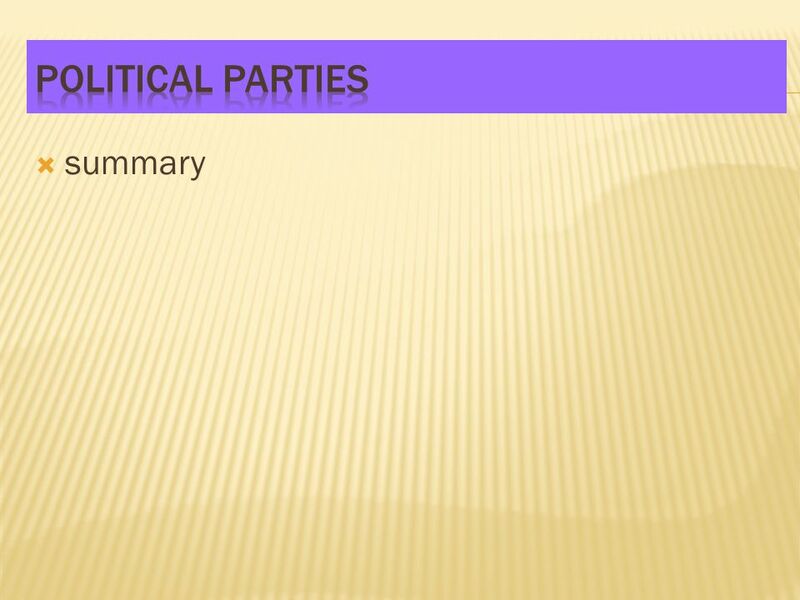 11 Political Parties What is the benefit of political parties – what do parties do? Most importantly, parties nominate candidates for election – they endorse them. 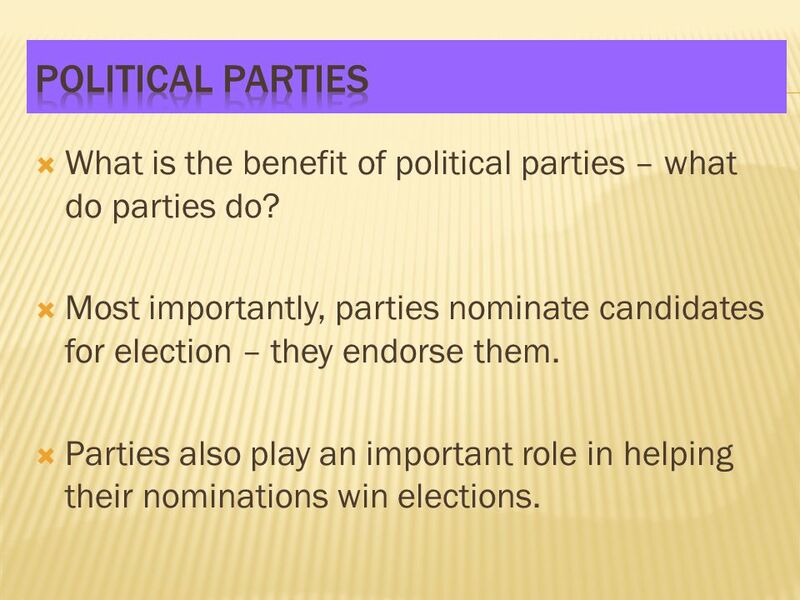 Parties also play an important role in helping their nominations win elections. 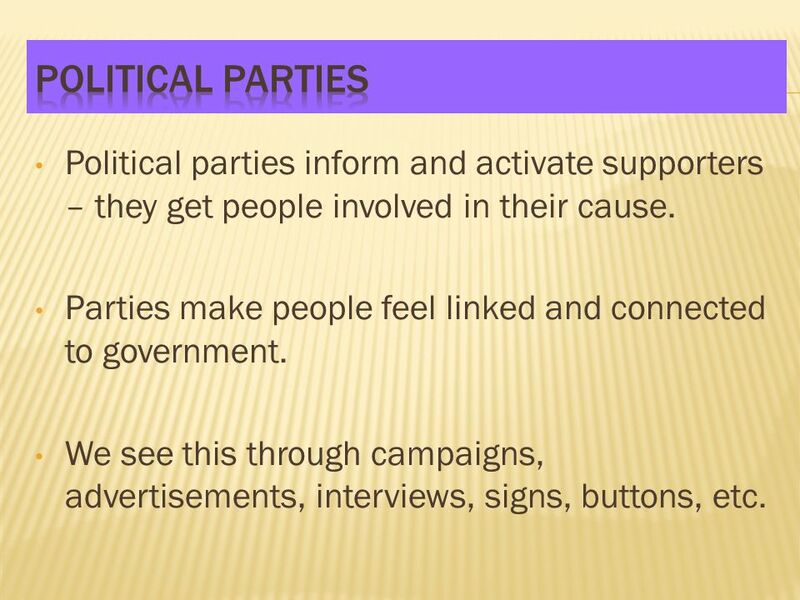 12 Political Parties Political parties inform and activate supporters – they get people involved in their cause. Parties make people feel linked and connected to government. We see this through campaigns, advertisements, interviews, signs, buttons, etc. 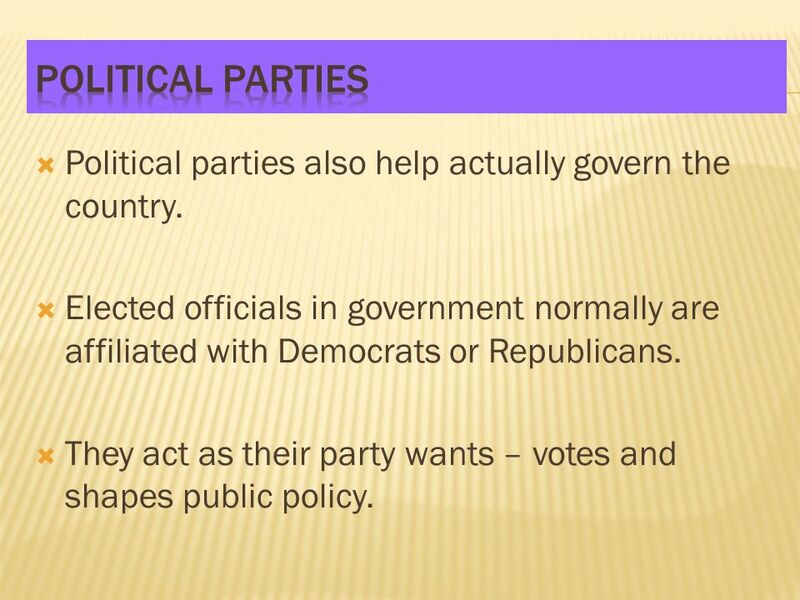 13 Political Parties Political parties also help actually govern the country. Elected officials in government normally are affiliated with Democrats or Republicans. They act as their party wants – votes and shapes public policy. 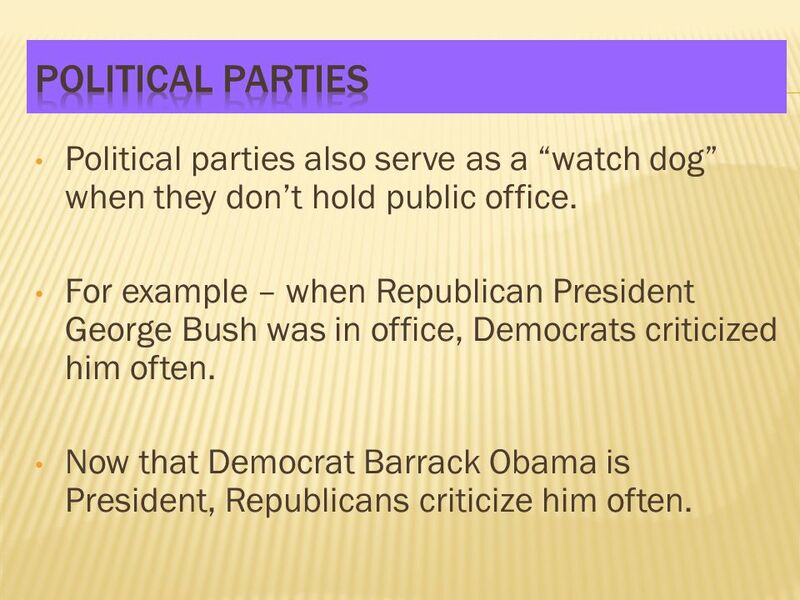 14 Political Parties Political parties also serve as a “watch dog” when they don’t hold public office. For example – when Republican President George Bush was in office, Democrats criticized him often. Now that Democrat Barrack Obama is President, Republicans criticize him often. 17 Political Parties The United States has traditionally functioned around a two-party system. Began when the Constitution was ratified – there were Federalists and Anti-Federalists. 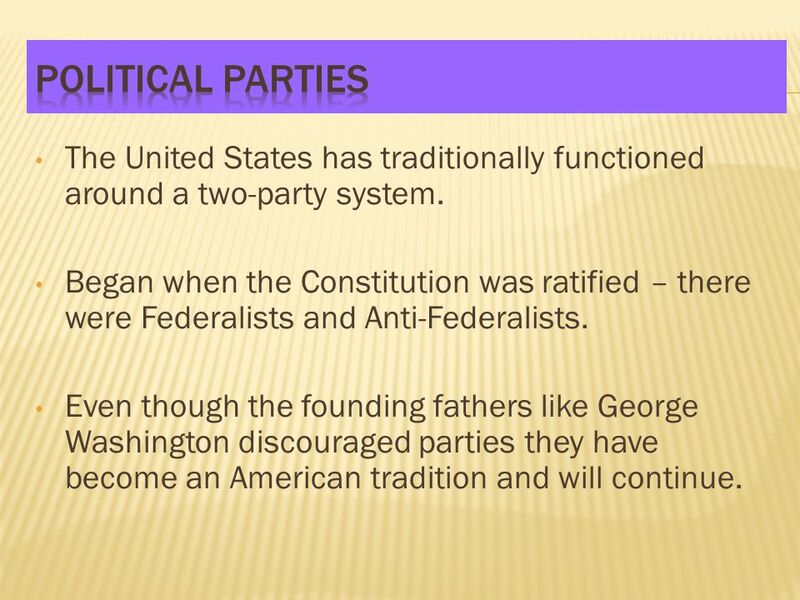 Even though the founding fathers like George Washington discouraged parties they have become an American tradition and will continue. 19 Minor Parties There are numerous minor parties in the U.S. Some are limited to certain states or regions of the nation. Some have been successful in getting national support and have existed for decades. 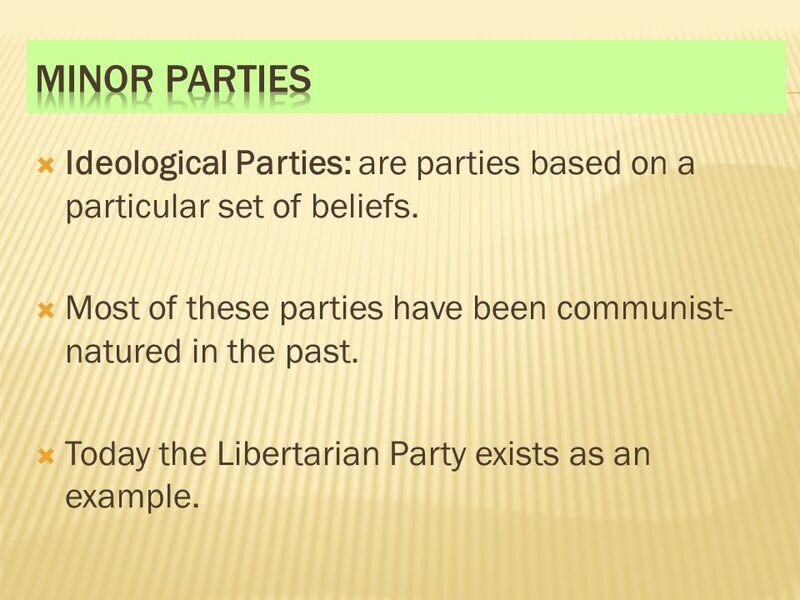 20 Minor Parties Ideological Parties: are parties based on a particular set of beliefs. Most of these parties have been communist-natured in the past. Today the Libertarian Party exists as an example. 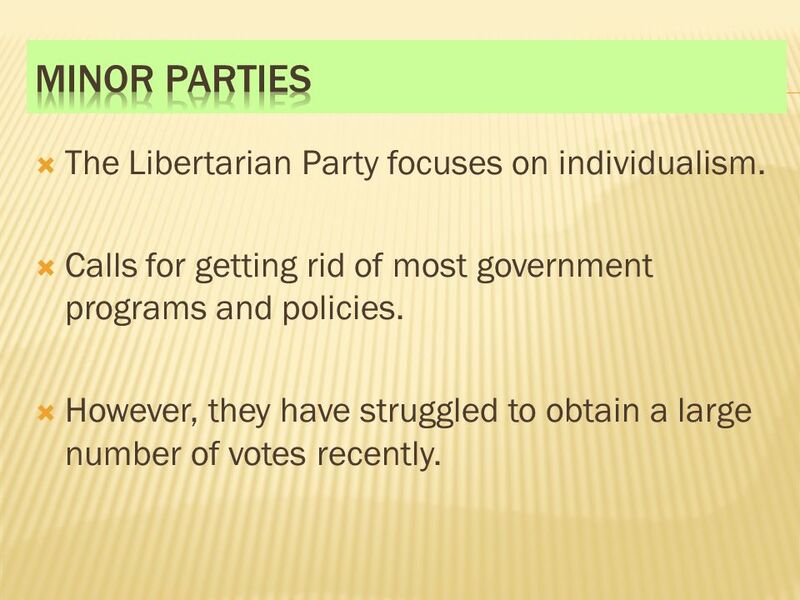 21 Minor Parties The Libertarian Party focuses on individualism. Calls for getting rid of most government programs and policies. However, they have struggled to obtain a large number of votes recently. 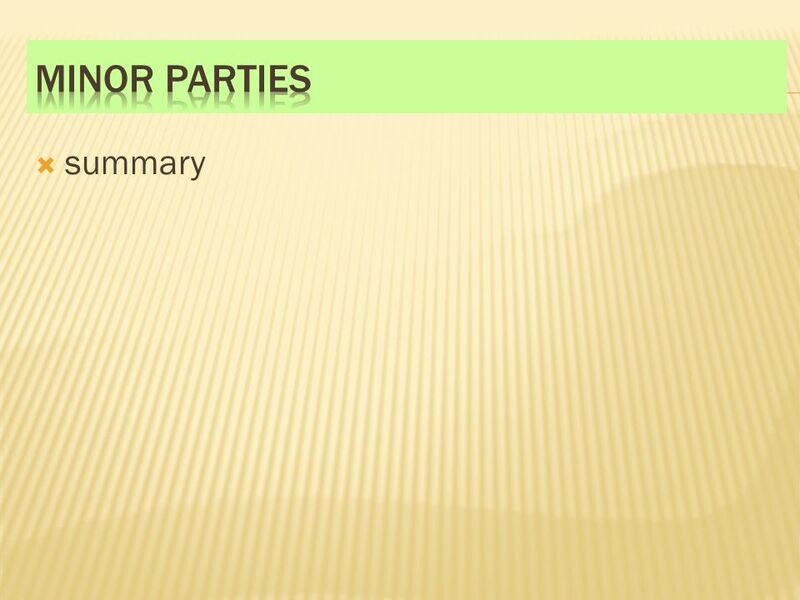 22 Minor Parties Single-Issue Parties: These parties focus on one public policy issue. Usually you can determine their platform from their name. 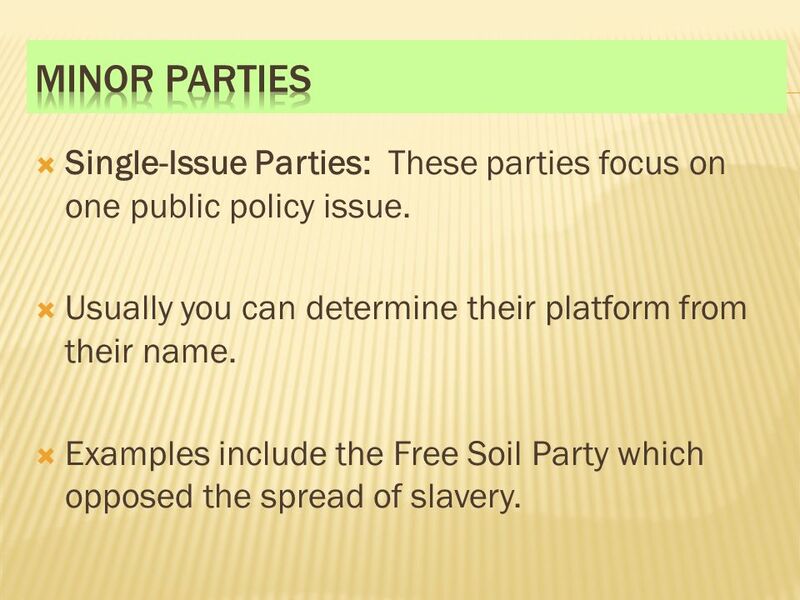 Examples include the Free Soil Party which opposed the spread of slavery. 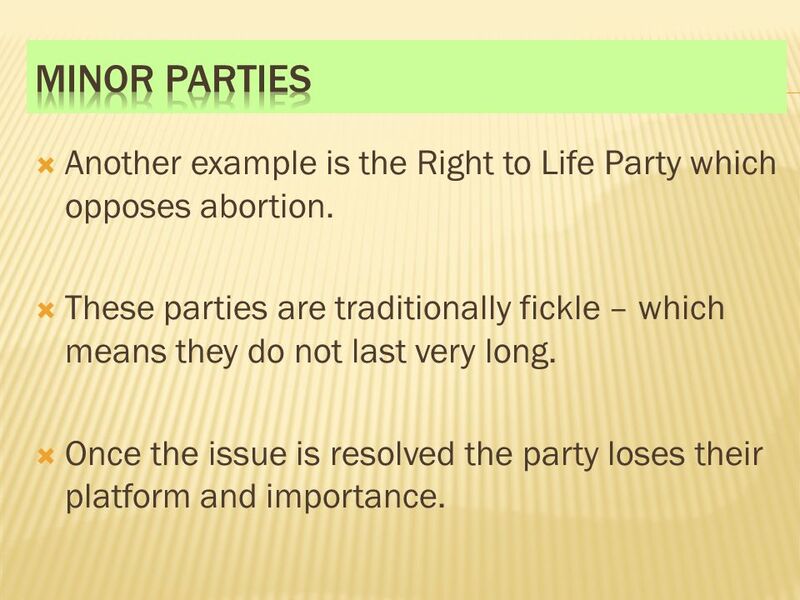 23 Minor Parties Another example is the Right to Life Party which opposes abortion. These parties are traditionally fickle – which means they do not last very long. Once the issue is resolved the party loses their platform and importance. 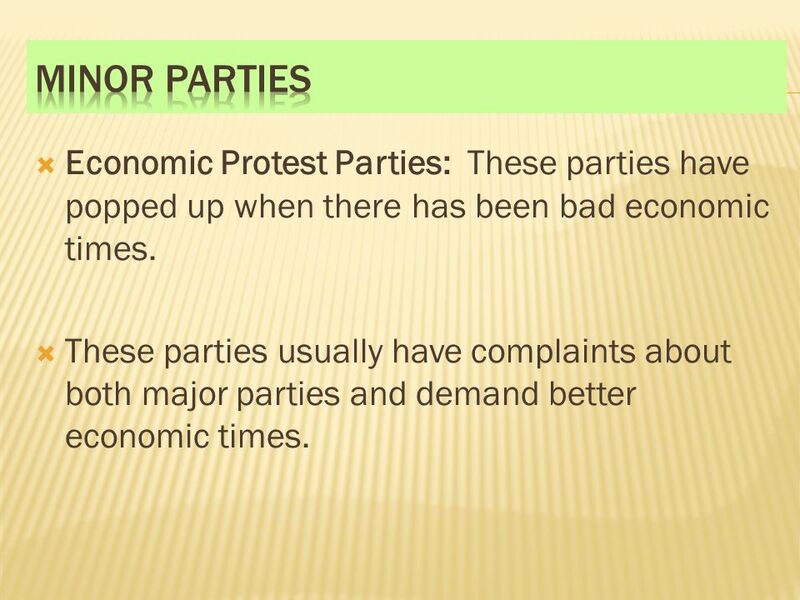 24 Minor Parties Economic Protest Parties: These parties have popped up when there has been bad economic times. These parties usually have complaints about both major parties and demand better economic times. 25 Minor Parties These parties usually call Wall Street “greedy” and “evil”. 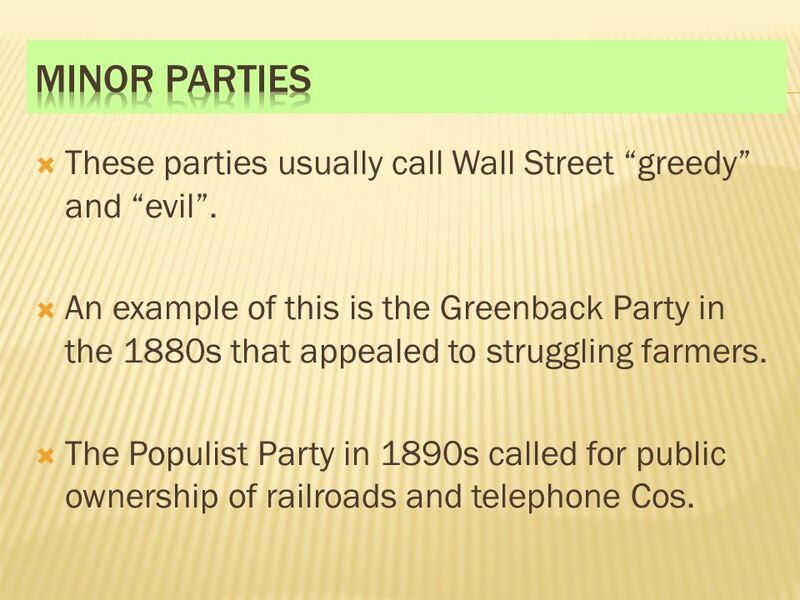 An example of this is the Greenback Party in the 1880s that appealed to struggling farmers. The Populist Party in 1890s called for public ownership of railroads and telephone Cos.
26 Minor Parties However, when the economy has climbed out of its troubles, these parties fade away. 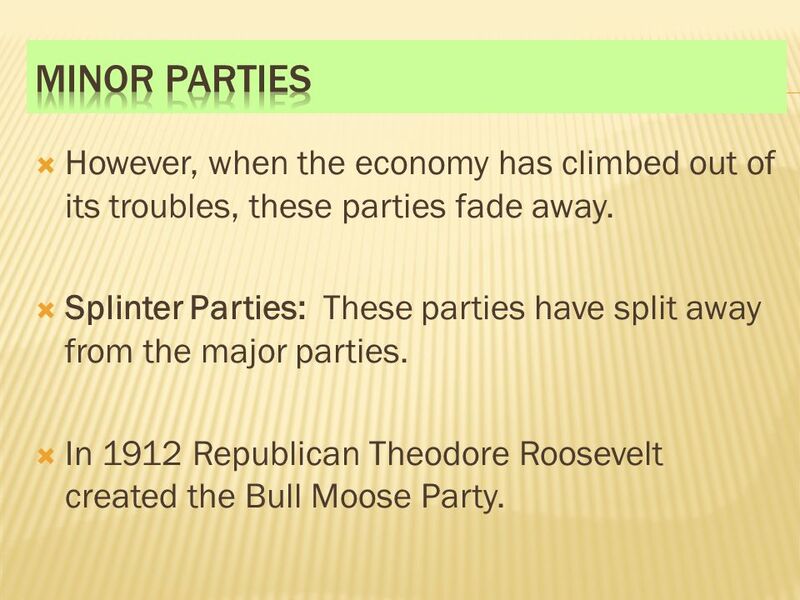 Splinter Parties: These parties have split away from the major parties. In 1912 Republican Theodore Roosevelt created the Bull Moose Party. 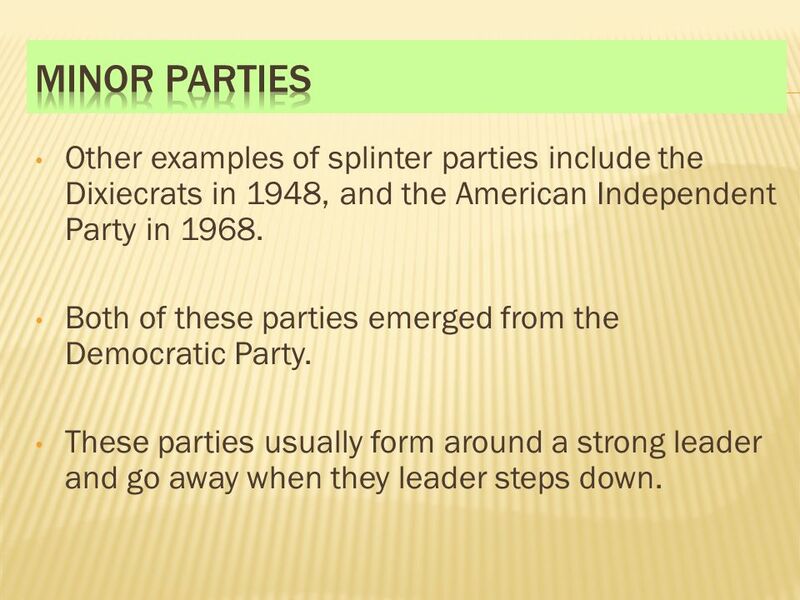 27 Minor Parties Other examples of splinter parties include the Dixiecrats in 1948, and the American Independent Party in 1968. Both of these parties emerged from the Democratic Party. These parties usually form around a strong leader and go away when they leader steps down. 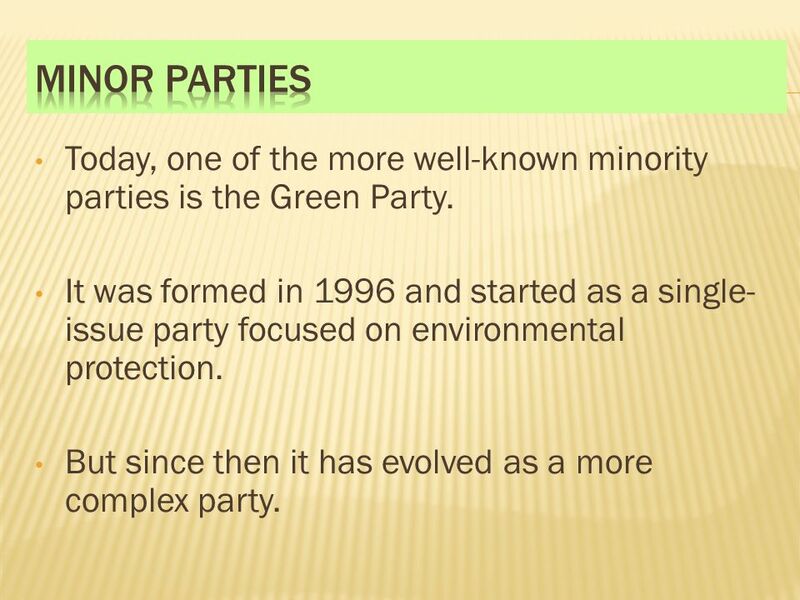 28 Minor Parties Today, one of the more well-known minority parties is the Green Party. It was formed in 1996 and started as a single-issue party focused on environmental protection. But since then it has evolved as a more complex party. 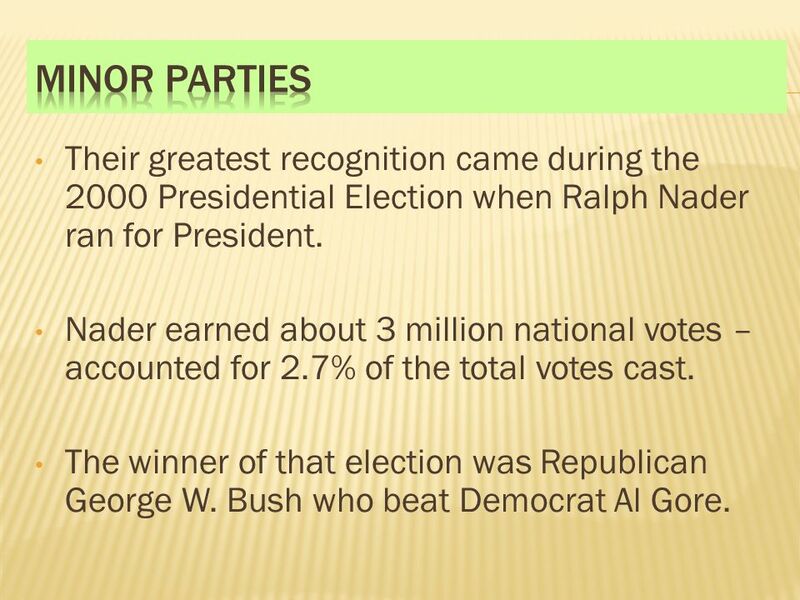 29 Minor Parties Their greatest recognition came during the 2000 Presidential Election when Ralph Nader ran for President. Nader earned about 3 million national votes – accounted for 2.7% of the total votes cast. 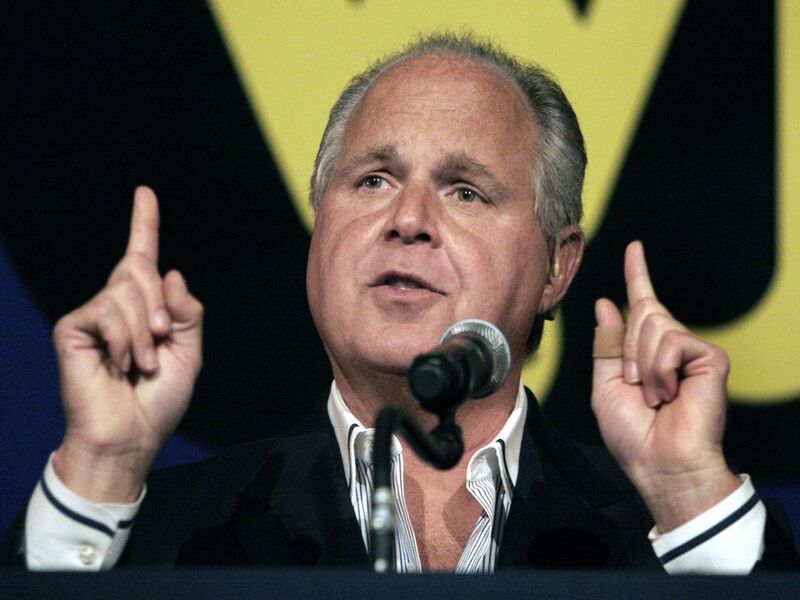 The winner of that election was Republican George W. Bush who beat Democrat Al Gore. 30 Minor Parties The election was extremely close and experts claim it was Nader that cost Gore the win. 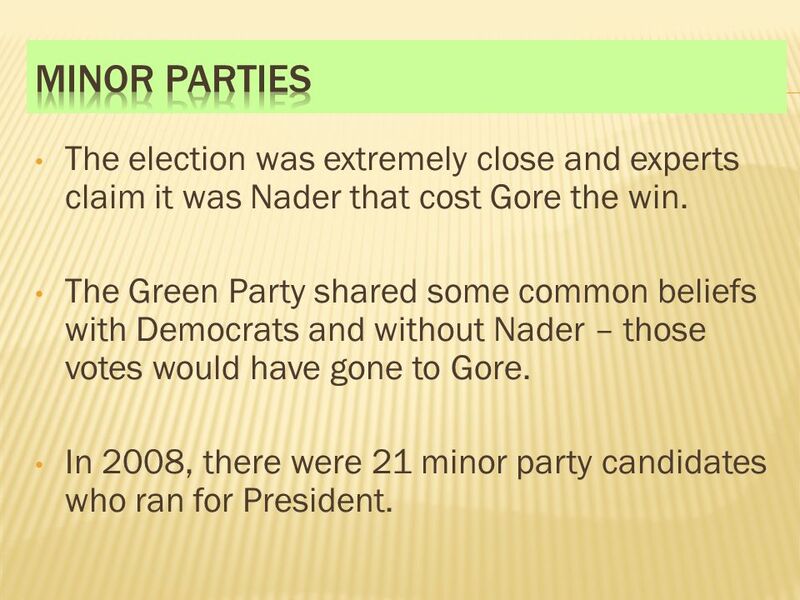 The Green Party shared some common beliefs with Democrats and without Nader – those votes would have gone to Gore. In 2008, there were 21 minor party candidates who ran for President. 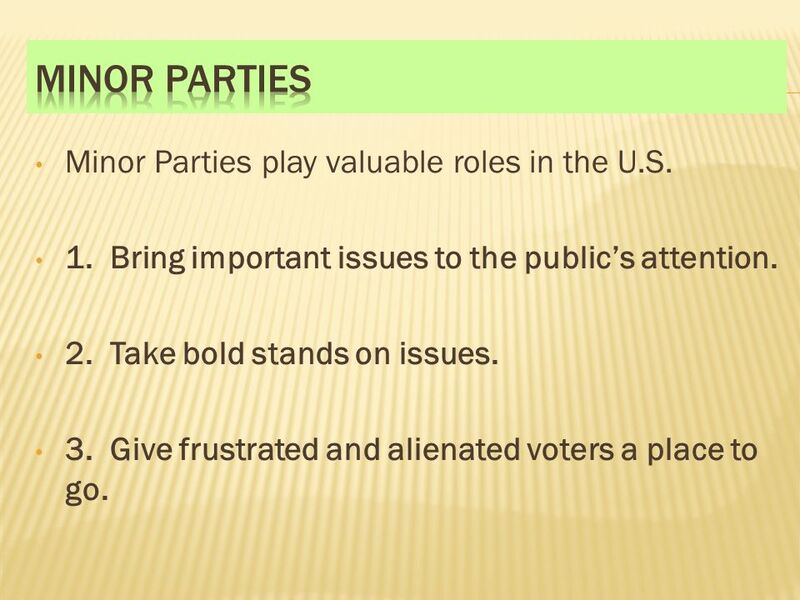 31 Minor Parties Minor Parties play valuable roles in the U.S.
1. Bring important issues to the public’s attention. 2. Take bold stands on issues. 3. Give frustrated and alienated voters a place to go. 33 The Right to Vote Voting qualifications are set by the states with some restrictions set by the Constitution. 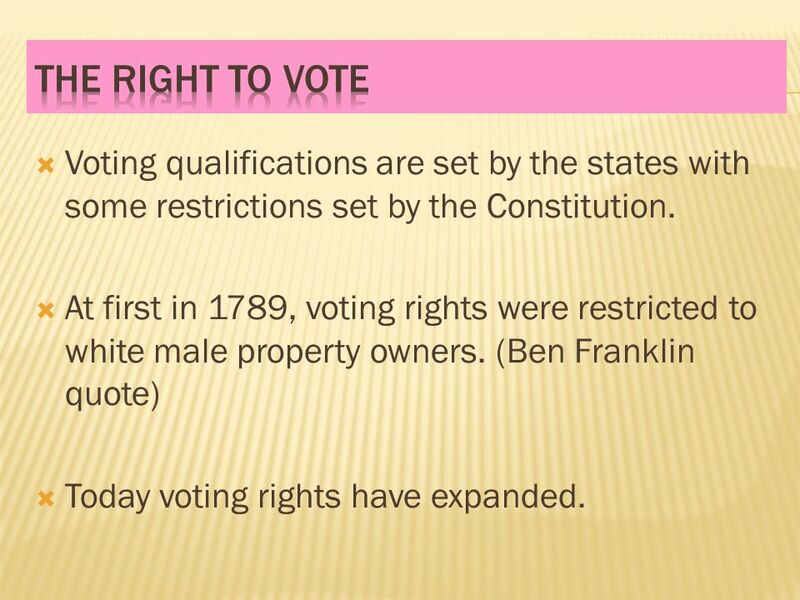 At first in 1789, voting rights were restricted to white male property owners. (Ben Franklin quote) Today voting rights have expanded. 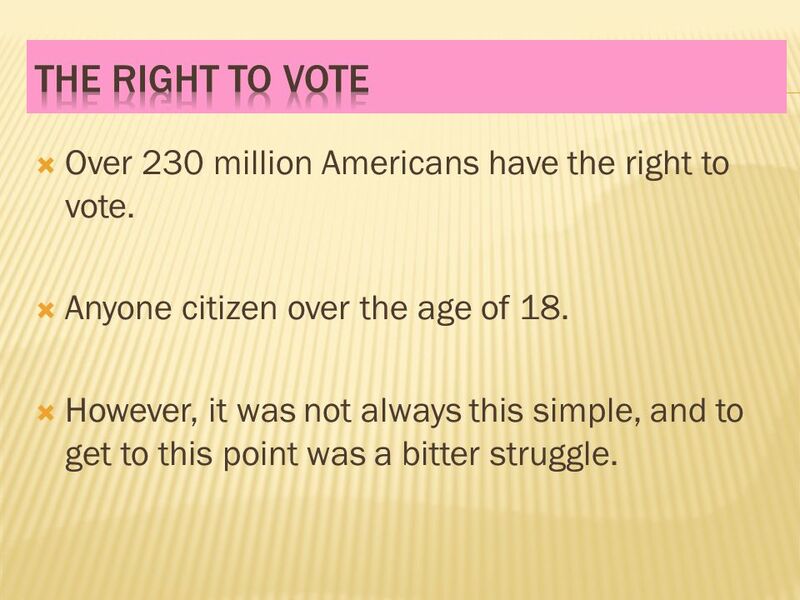 34 The Right to Vote Over 230 million Americans have the right to vote. Anyone citizen over the age of 18. However, it was not always this simple, and to get to this point was a bitter struggle. 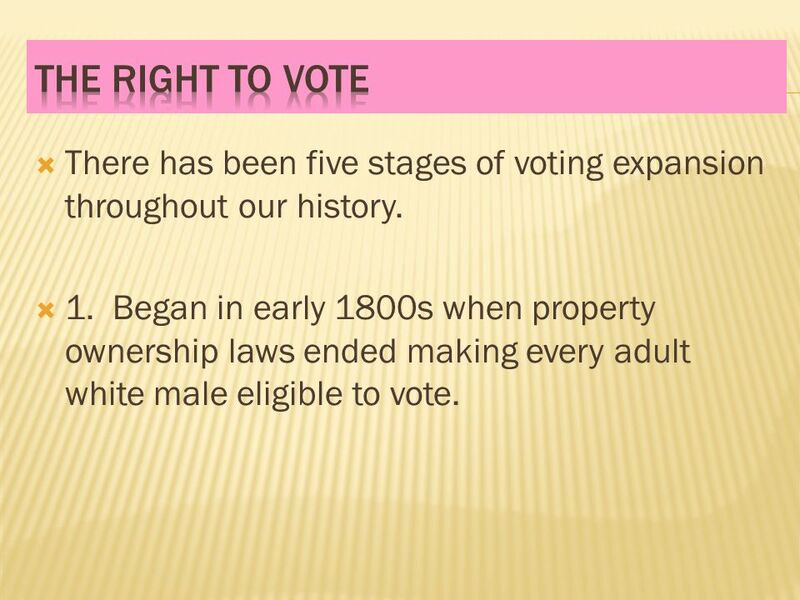 35 The Right to Vote There has been five stages of voting expansion throughout our history. 1. Began in early 1800s when property ownership laws ended making every adult white male eligible to vote. 36 The Right to Vote 2. Came after the Civil War with the 15th Amendment. It protected every citizens right to vote no matter their race or color. 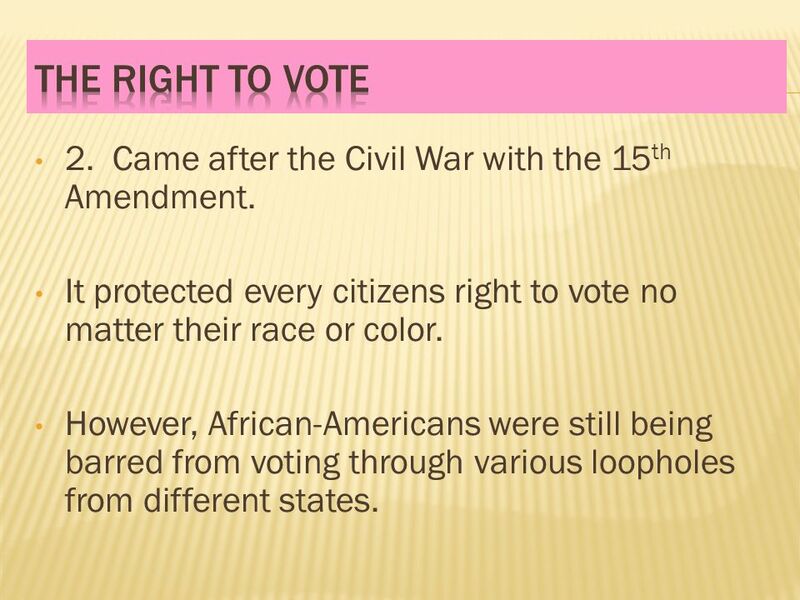 However, African-Americans were still being barred from voting through various loopholes from different states. 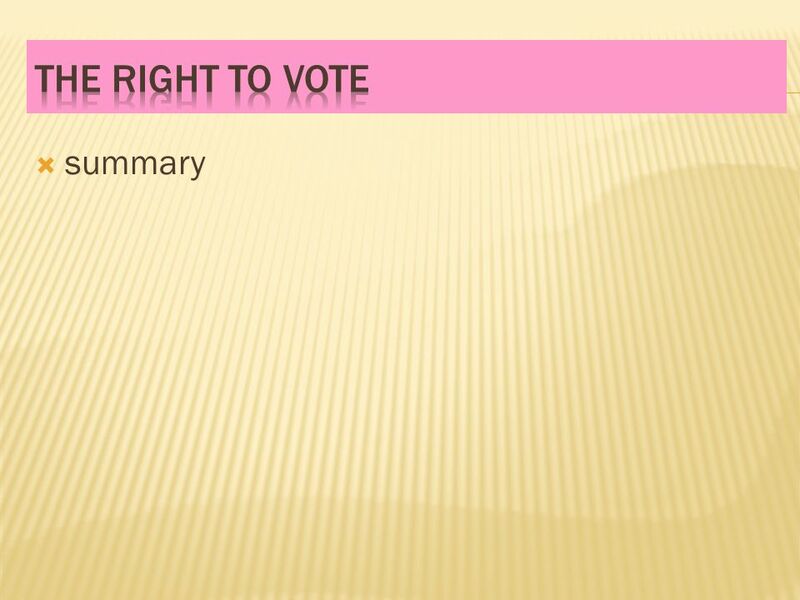 37 The Right to Vote 3. The 19th Amendment passed in 1920 as a result of the Suffragist Movement. 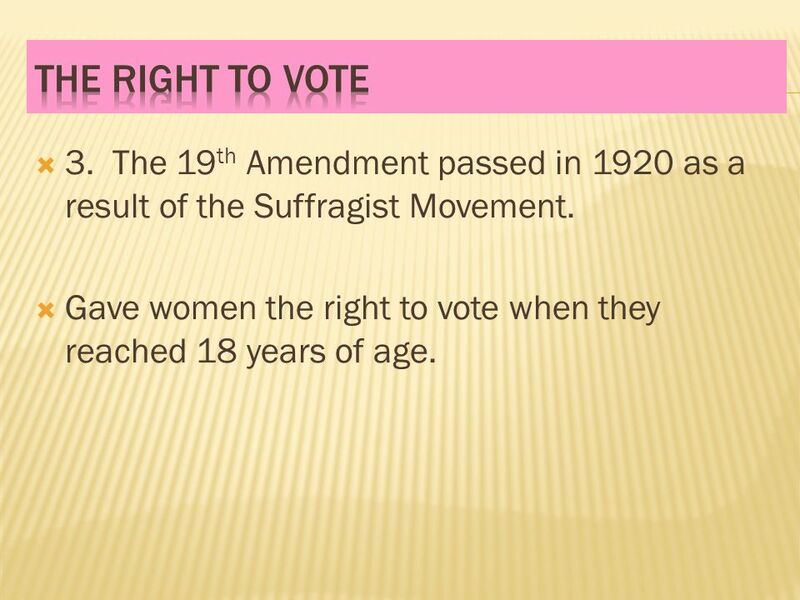 Gave women the right to vote when they reached 18 years of age. 38 The Right to Vote 4. 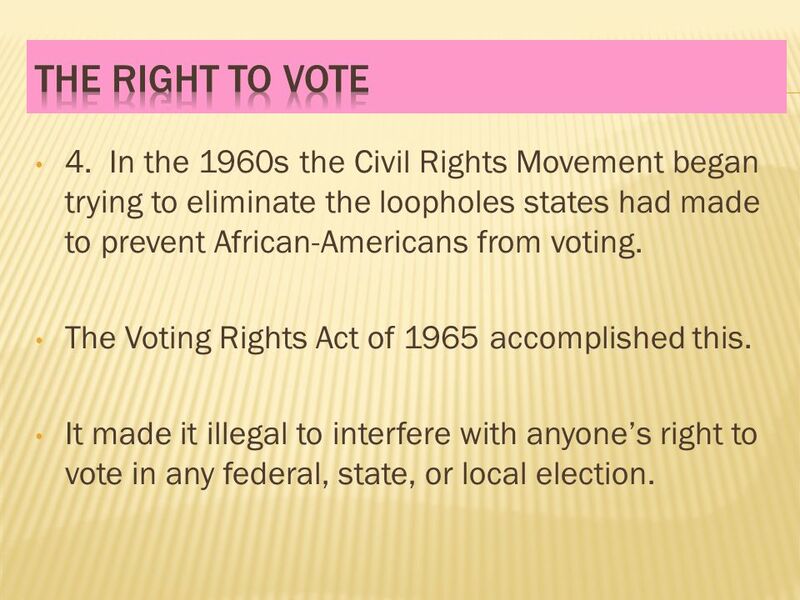 In the 1960s the Civil Rights Movement began trying to eliminate the loopholes states had made to prevent African-Americans from voting. The Voting Rights Act of 1965 accomplished this. It made it illegal to interfere with anyone’s right to vote in any federal, state, or local election. 39 The Right to Vote 5. 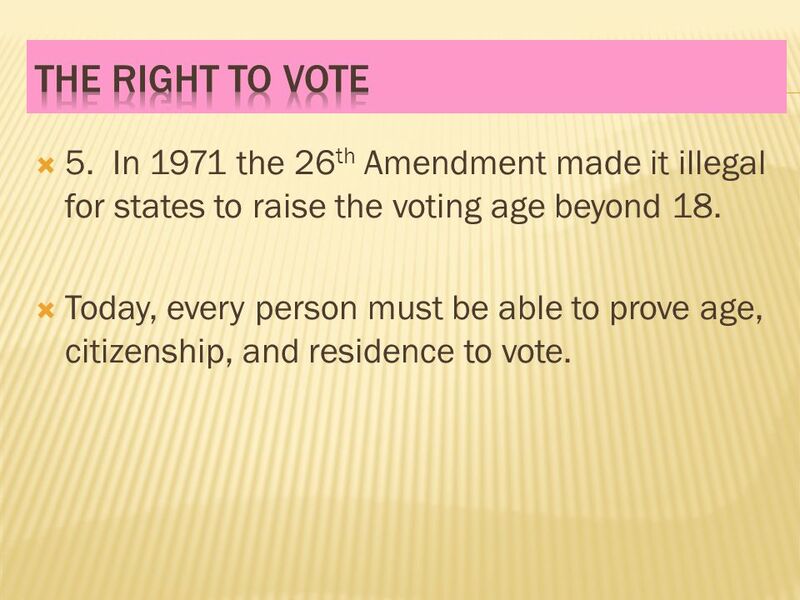 In 1971 the 26th Amendment made it illegal for states to raise the voting age beyond 18. Today, every person must be able to prove age, citizenship, and residence to vote. 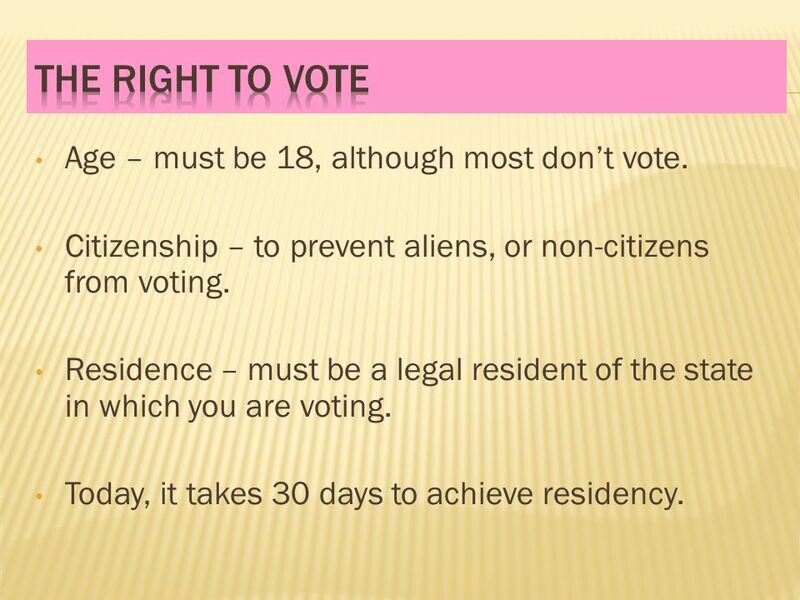 40 The Right to Vote Age – must be 18, although most don’t vote. Citizenship – to prevent aliens, or non-citizens from voting. Residence – must be a legal resident of the state in which you are voting. Today, it takes 30 days to achieve residency. 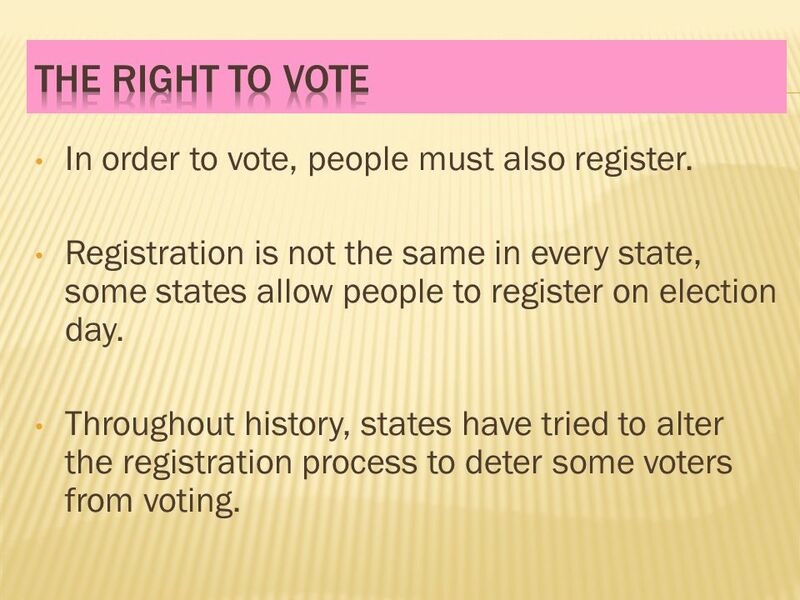 41 The Right to Vote In order to vote, people must also register. Registration is not the same in every state, some states allow people to register on election day. Throughout history, states have tried to alter the registration process to deter some voters from voting. 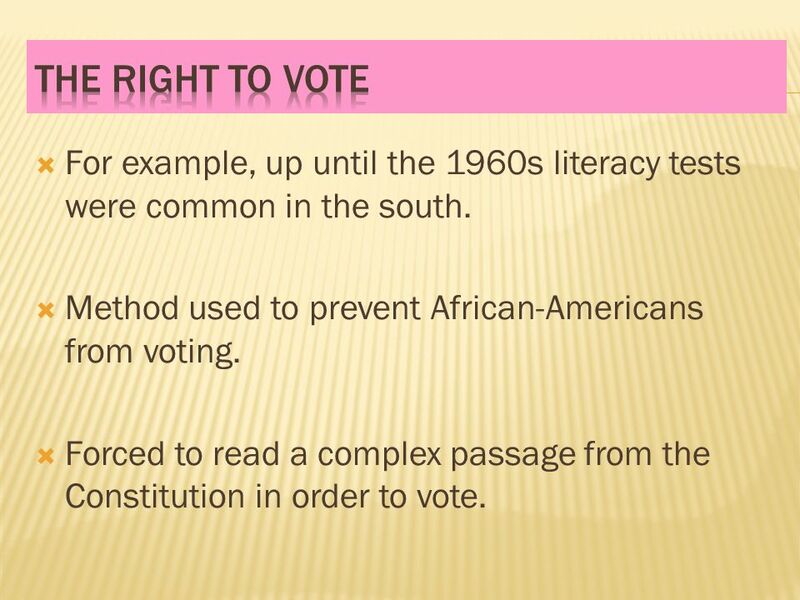 42 The Right to Vote For example, up until the 1960s literacy tests were common in the south. 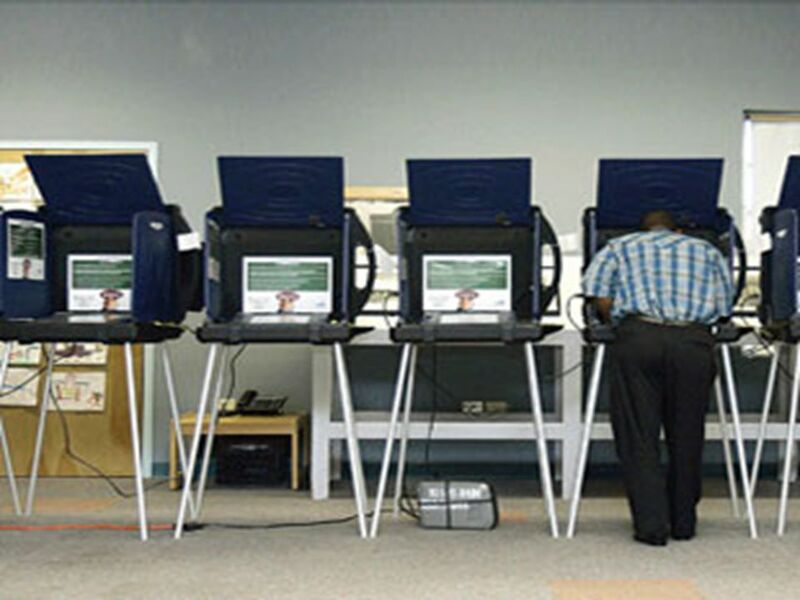 Method used to prevent African-Americans from voting. Forced to read a complex passage from the Constitution in order to vote. 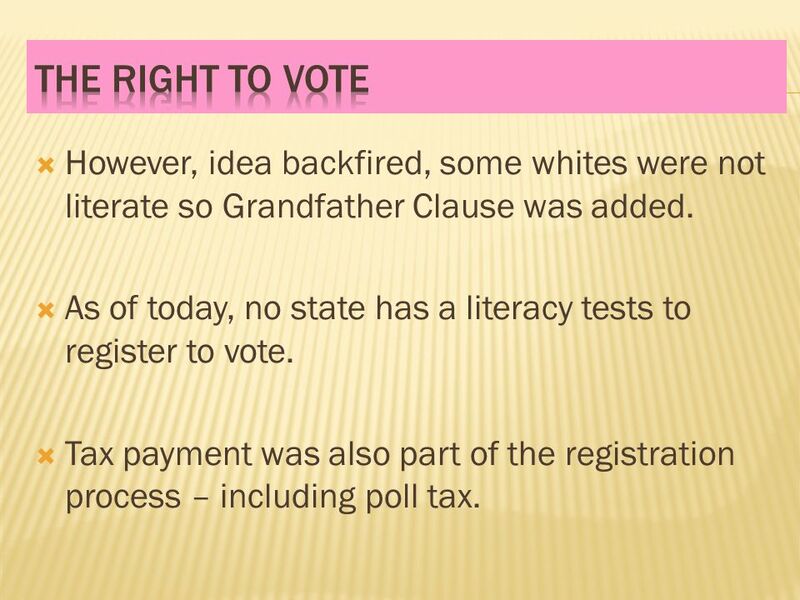 43 The Right to Vote However, idea backfired, some whites were not literate so Grandfather Clause was added. As of today, no state has a literacy tests to register to vote. Tax payment was also part of the registration process – including poll tax. 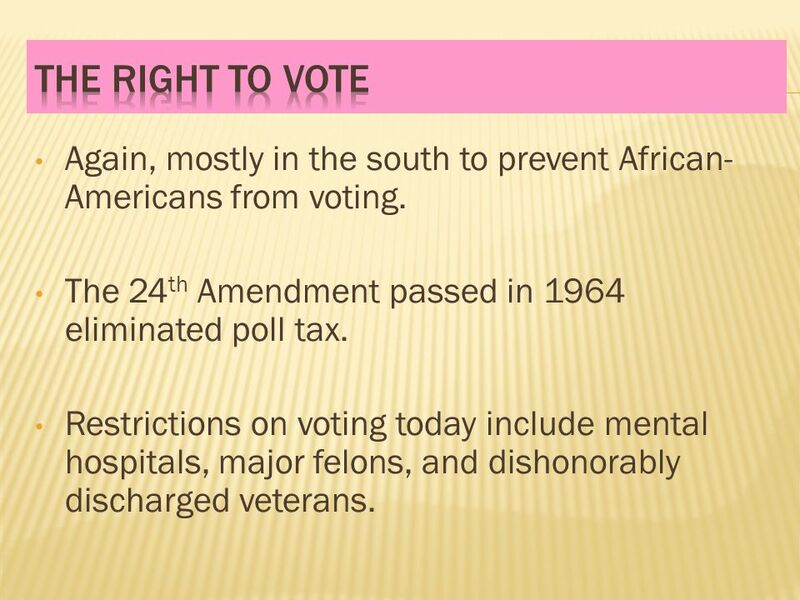 44 The Right to Vote Again, mostly in the south to prevent African-Americans from voting. The 24th Amendment passed in 1964 eliminated poll tax. Restrictions on voting today include mental hospitals, major felons, and dishonorably discharged veterans. 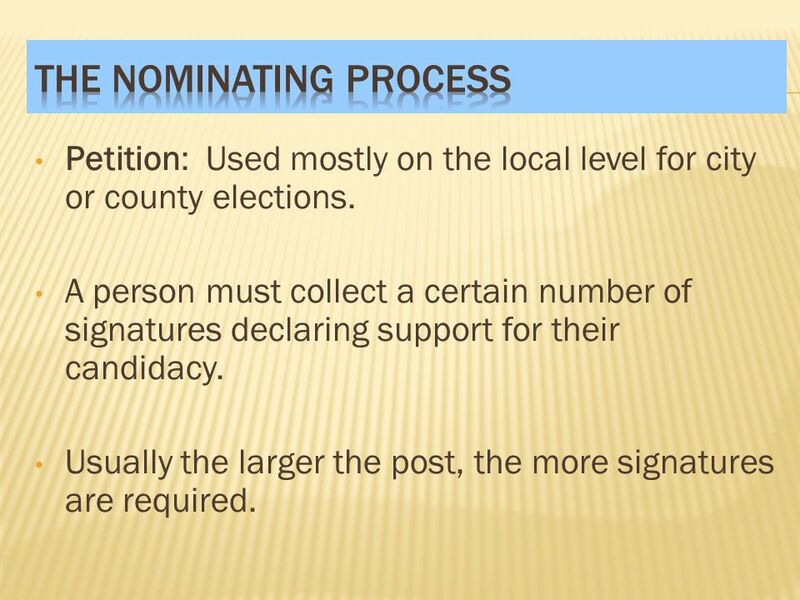 The nominating process is the process of candidate selection. 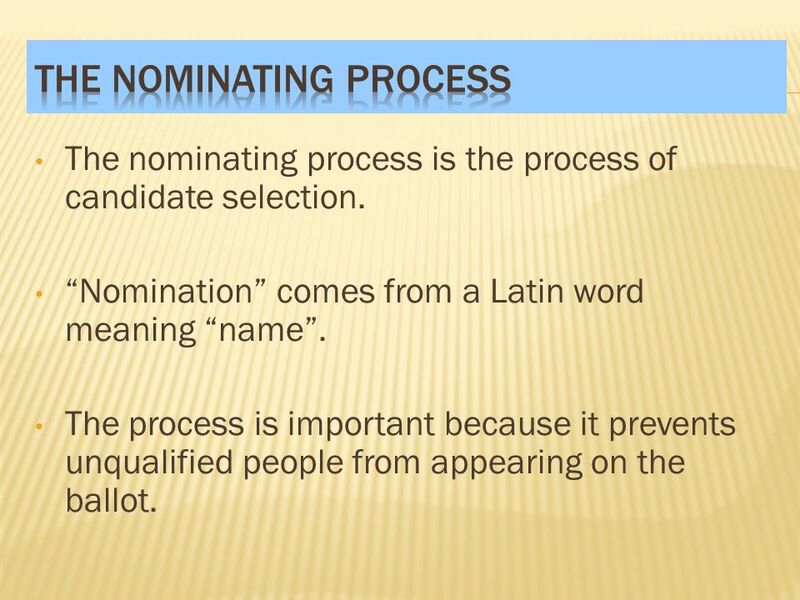 “Nomination” comes from a Latin word meaning “name”. 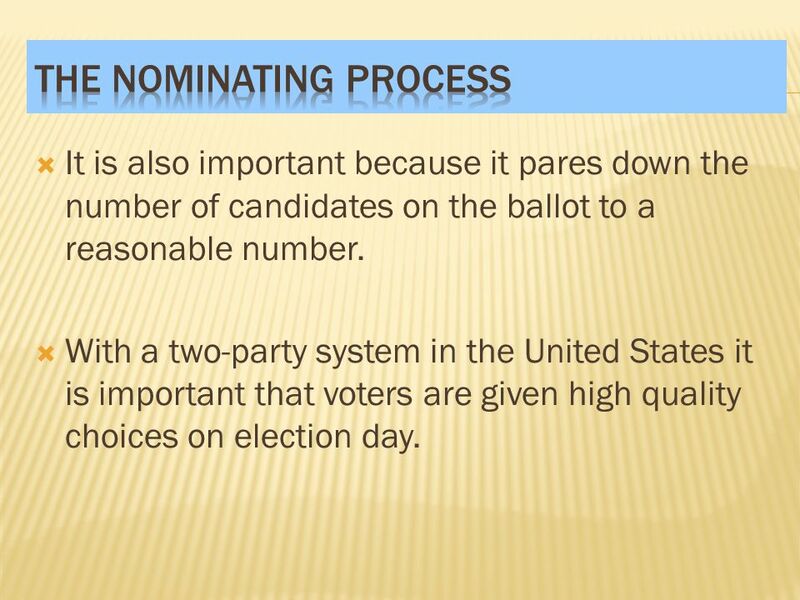 The process is important because it prevents unqualified people from appearing on the ballot. It is also important because it pares down the number of candidates on the ballot to a reasonable number. With a two-party system in the United States it is important that voters are given high quality choices on election day. 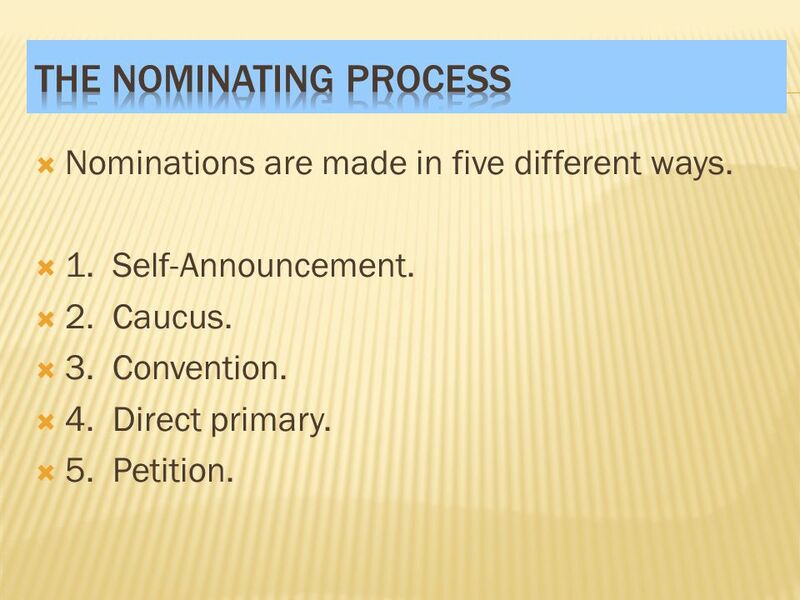 Nominations are made in five different ways. 1. Self-Announcement. 2. Caucus. 3. Convention. 4. 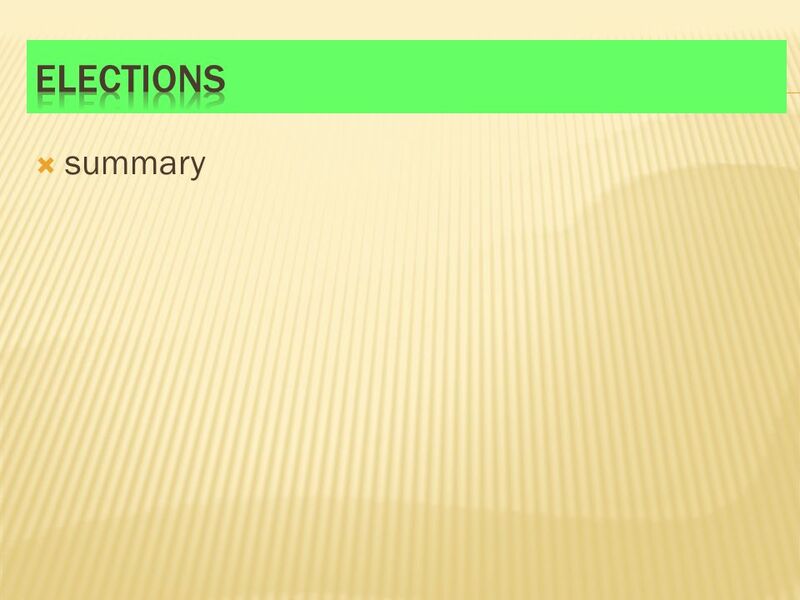 Direct primary. 5. Petition. 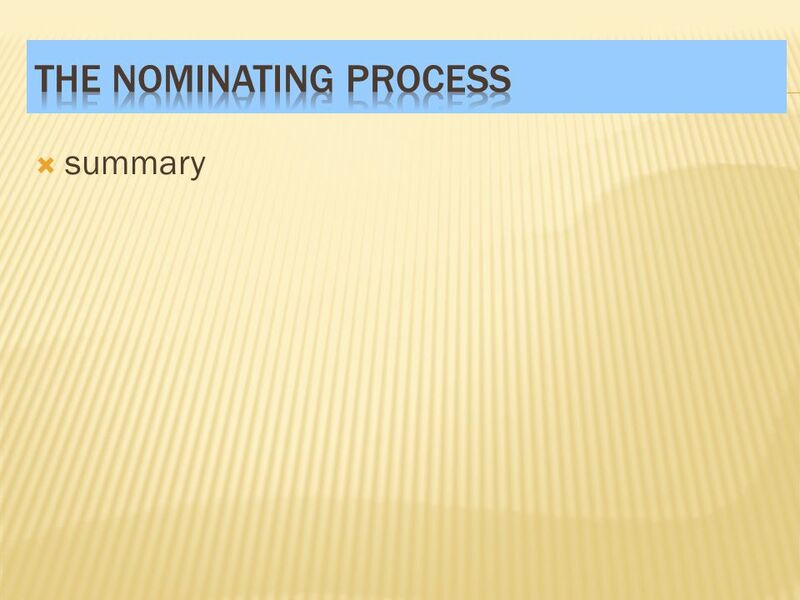 Self-Announcement: This type of nomination is the oldest form. 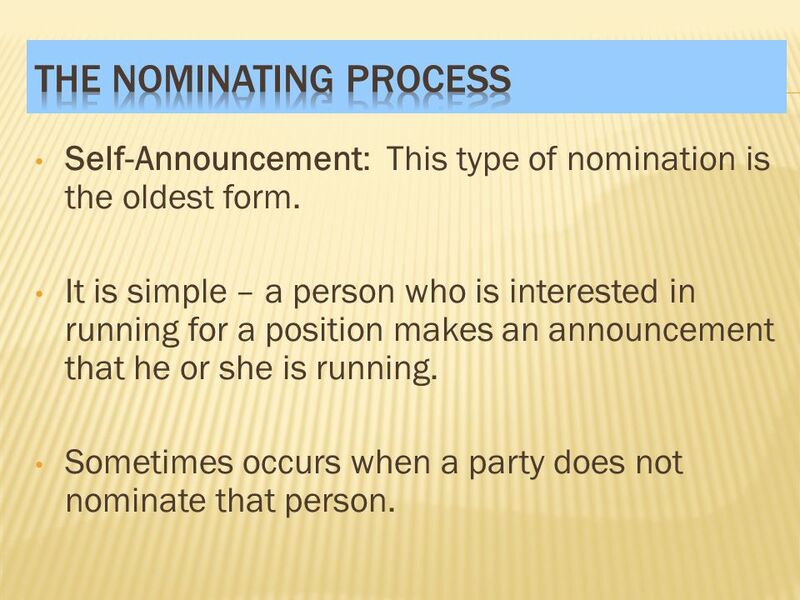 It is simple – a person who is interested in running for a position makes an announcement that he or she is running. Sometimes occurs when a party does not nominate that person. 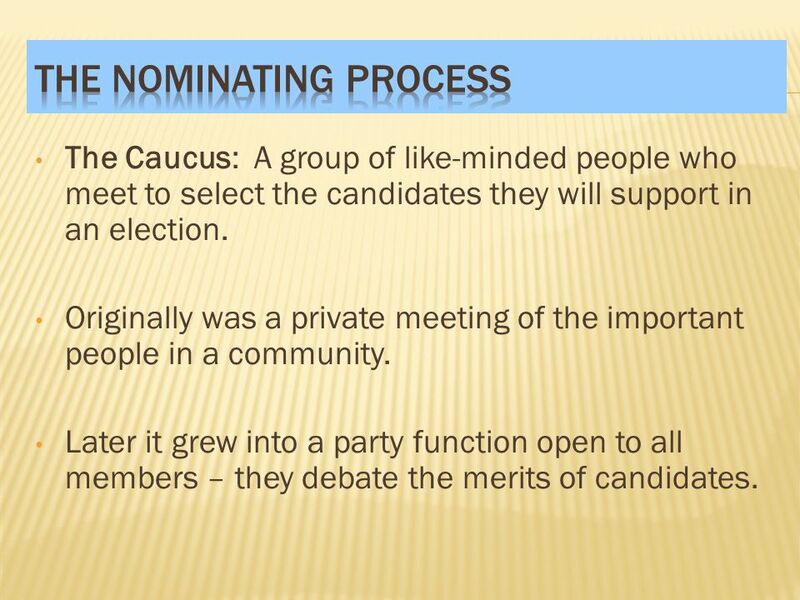 The Caucus: A group of like-minded people who meet to select the candidates they will support in an election. Originally was a private meeting of the important people in a community. Later it grew into a party function open to all members – they debate the merits of candidates. 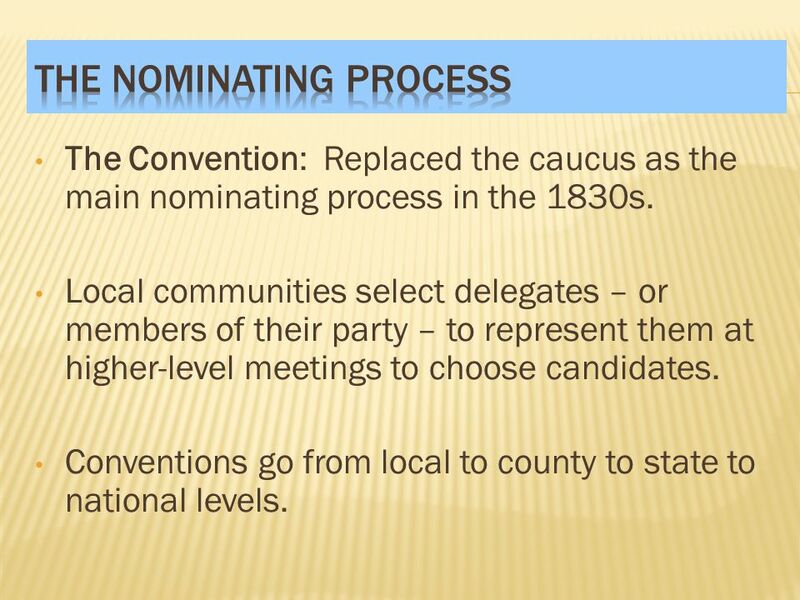 The Convention: Replaced the caucus as the main nominating process in the 1830s. Local communities select delegates – or members of their party – to represent them at higher-level meetings to choose candidates. Conventions go from local to county to state to national levels. However, conventions lost their nominating power as corruption set in denying democracy the chance to choose candidates. 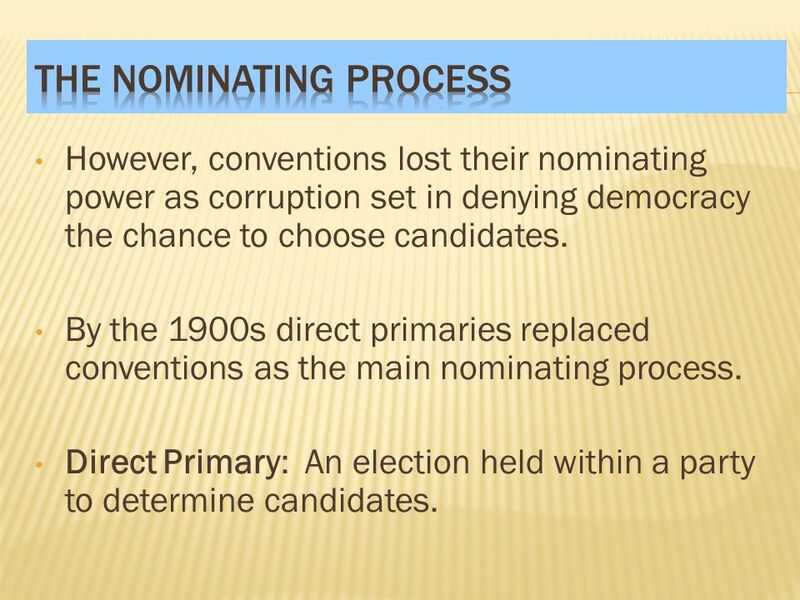 By the 1900s direct primaries replaced conventions as the main nominating process. Direct Primary: An election held within a party to determine candidates. States usually control primary elections – setting dates, polling places, and results. There are two basic forms of direct primaries: 1. closed primary, and 2. open primary. 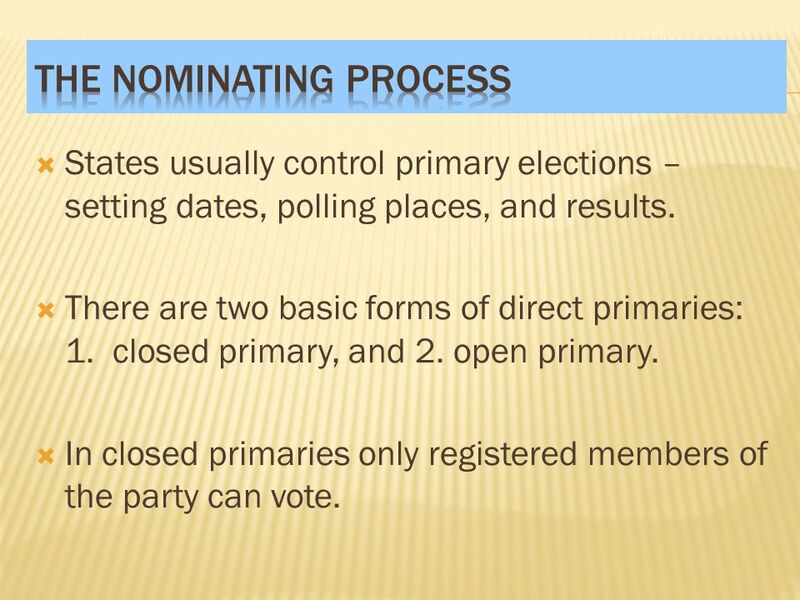 In closed primaries only registered members of the party can vote. 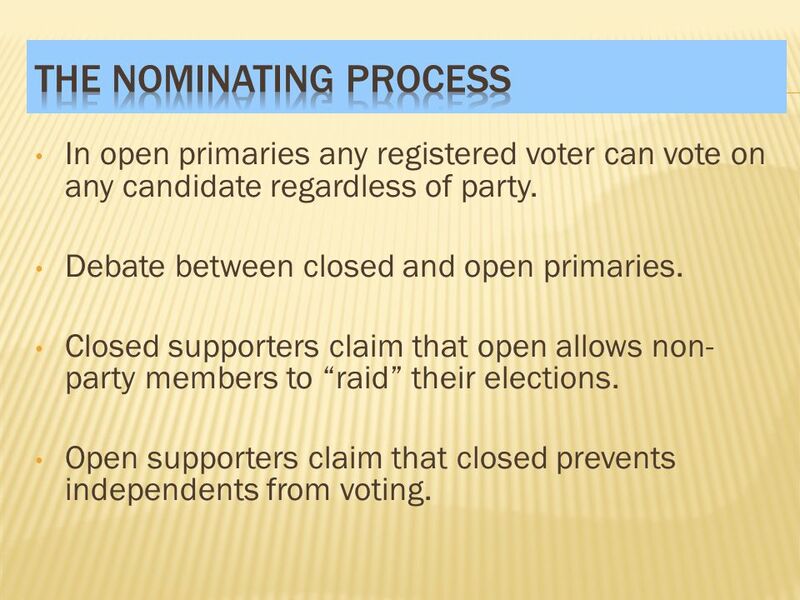 In open primaries any registered voter can vote on any candidate regardless of party. Debate between closed and open primaries. Closed supporters claim that open allows non-party members to “raid” their elections. Open supporters claim that closed prevents independents from voting. 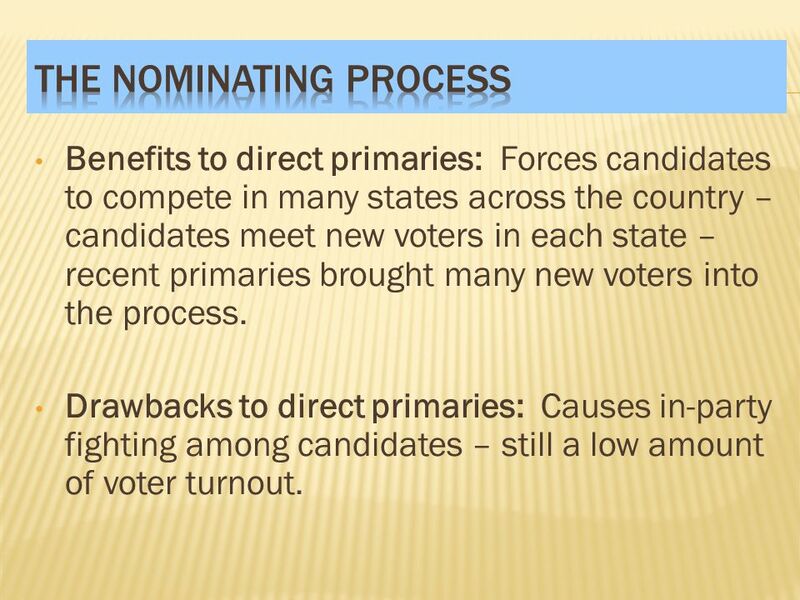 Benefits to direct primaries: Forces candidates to compete in many states across the country – candidates meet new voters in each state – recent primaries brought many new voters into the process. Drawbacks to direct primaries: Causes in-party fighting among candidates – still a low amount of voter turnout. Petition: Used mostly on the local level for city or county elections. A person must collect a certain number of signatures declaring support for their candidacy. Usually the larger the post, the more signatures are required. 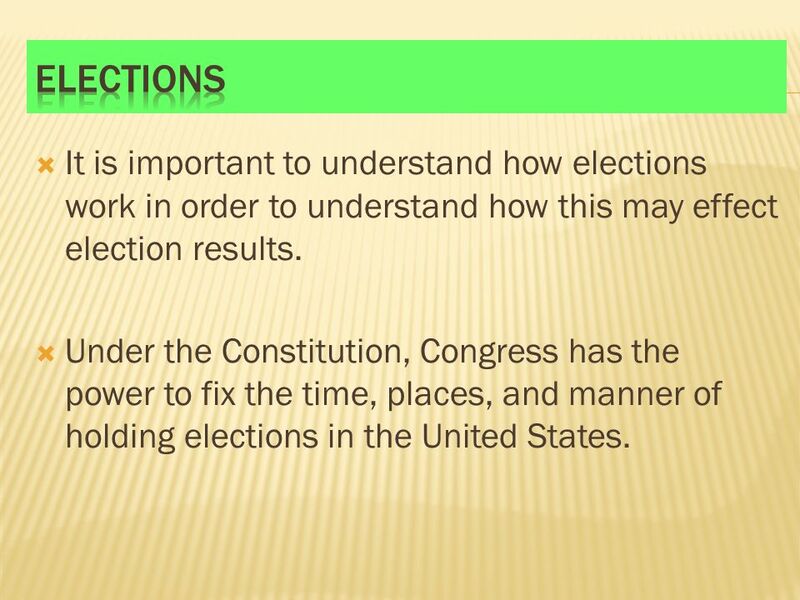 58 Elections It is important to understand how elections work in order to understand how this may effect election results. Under the Constitution, Congress has the power to fix the time, places, and manner of holding elections in the United States. 59 Elections Elections are held on the first Tuesday following the first Monday in November on even-numbered years. However, there are voting options for people other than that day. 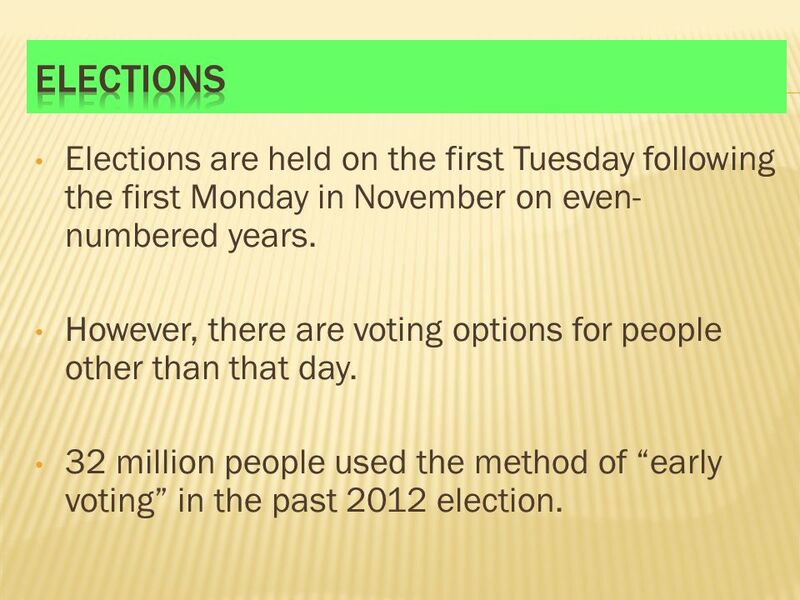 32 million people used the method of “early voting” in the past 2012 election. 60 Elections Most of these early voters used the absentee ballot as the means of voting. 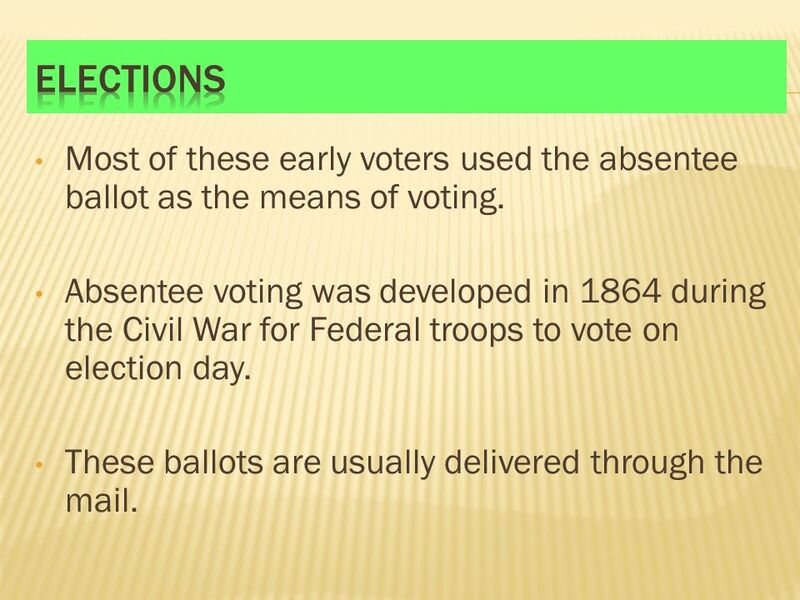 Absentee voting was developed in 1864 during the Civil War for Federal troops to vote on election day. These ballots are usually delivered through the mail. 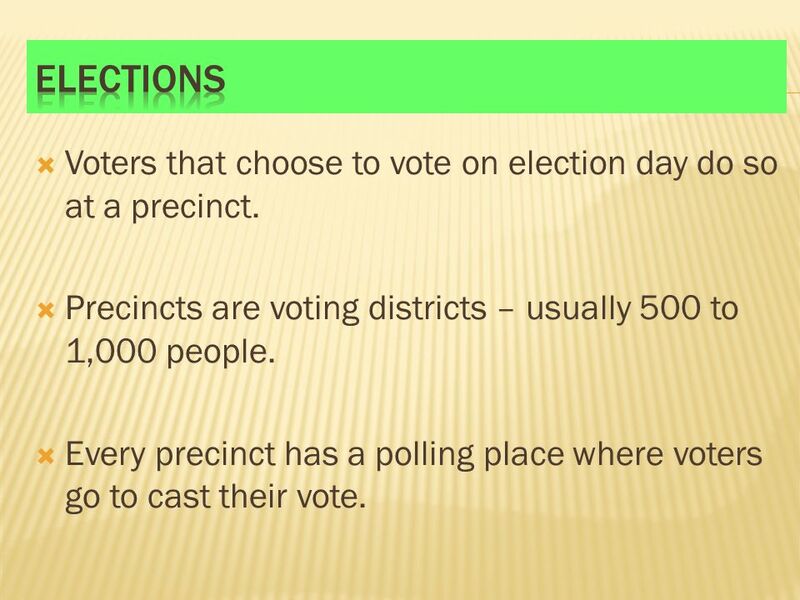 61 Elections Voters that choose to vote on election day do so at a precinct. Precincts are voting districts – usually 500 to 1,000 people. Every precinct has a polling place where voters go to cast their vote. 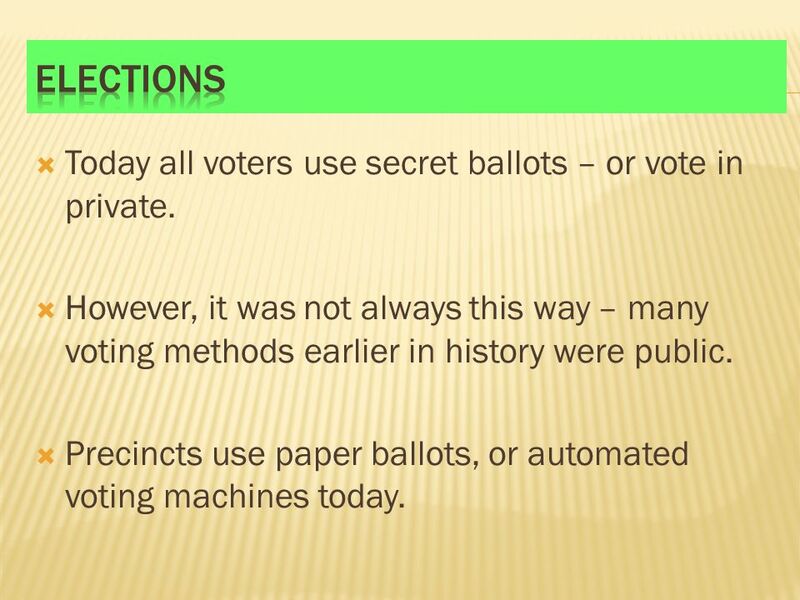 62 Elections Today all voters use secret ballots – or vote in private. However, it was not always this way – many voting methods earlier in history were public. Precincts use paper ballots, or automated voting machines today. 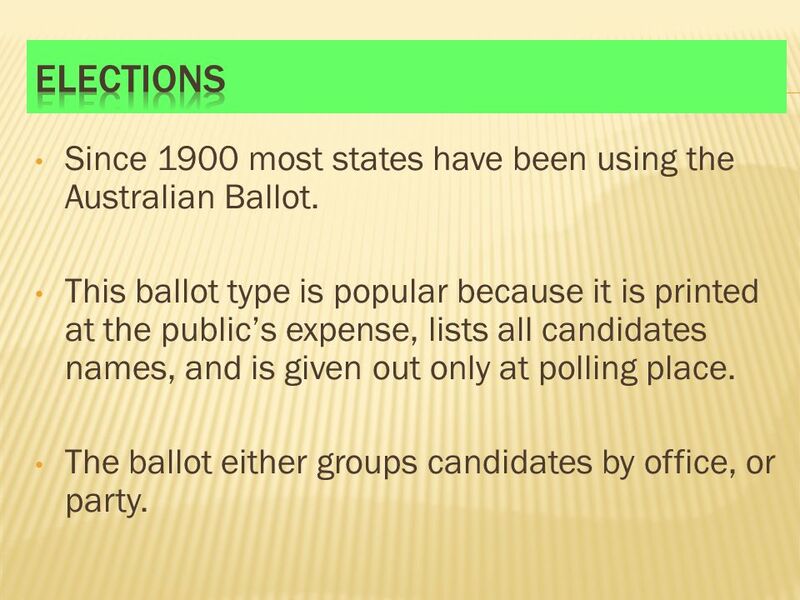 63 Elections Since 1900 most states have been using the Australian Ballot. 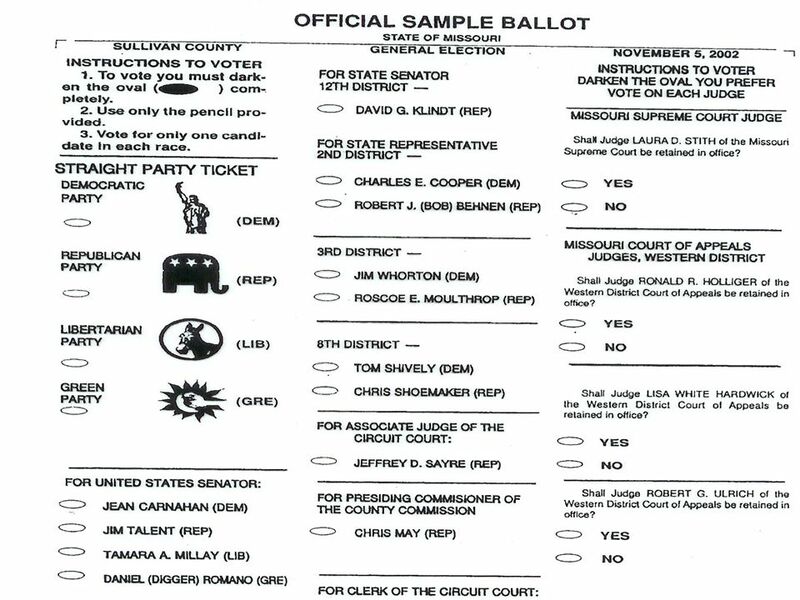 This ballot type is popular because it is printed at the public’s expense, lists all candidates names, and is given out only at polling place. 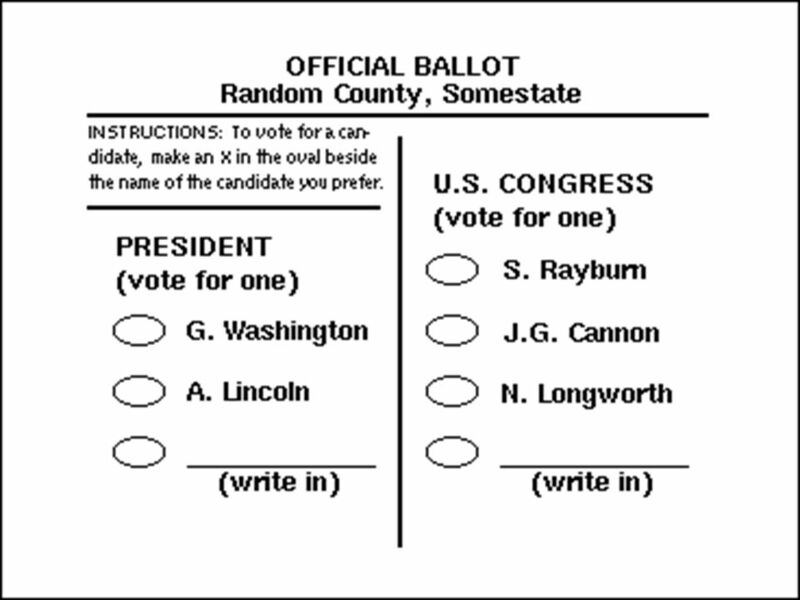 The ballot either groups candidates by office, or party. 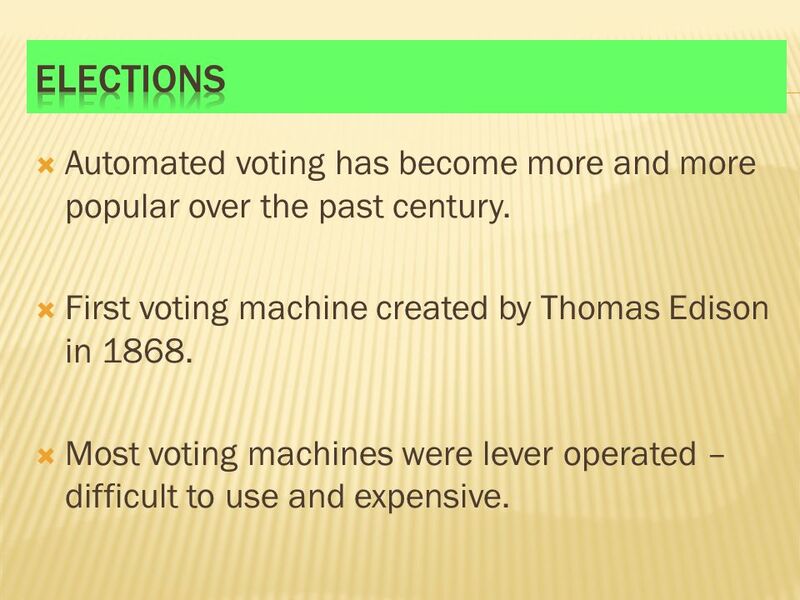 66 Elections Automated voting has become more and more popular over the past century. First voting machine created by Thomas Edison in 1868. 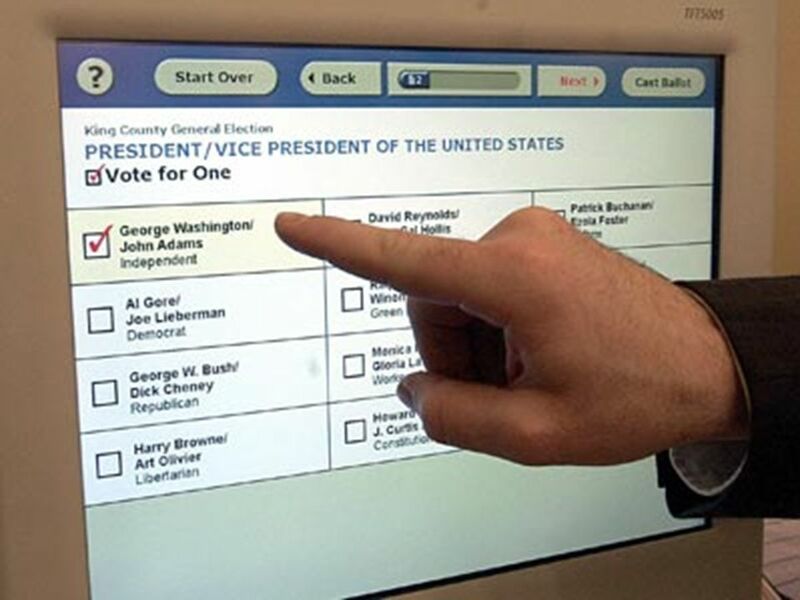 Most voting machines were lever operated – difficult to use and expensive. 67 Elections Electronic vote counting was also introduced in the 1960s. 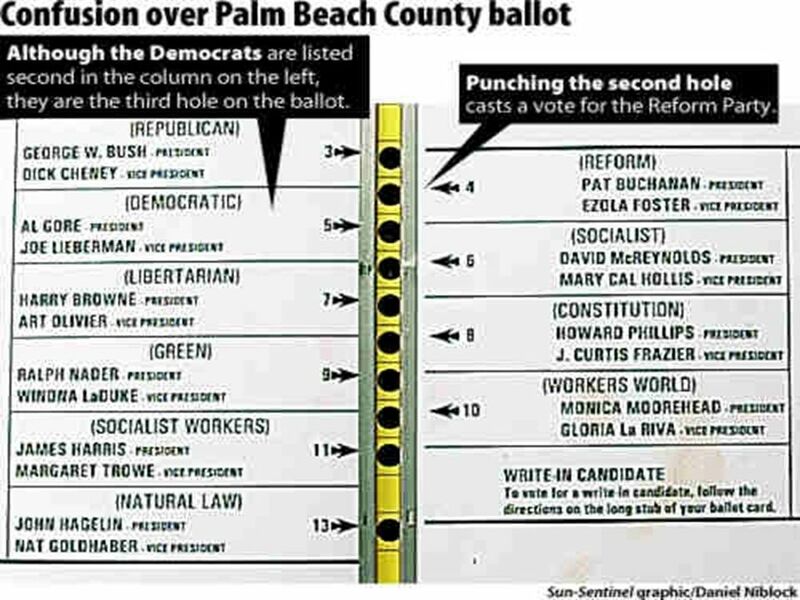 Voters receive voting punch cards – punch a hole next to the candidate you want to vote for. 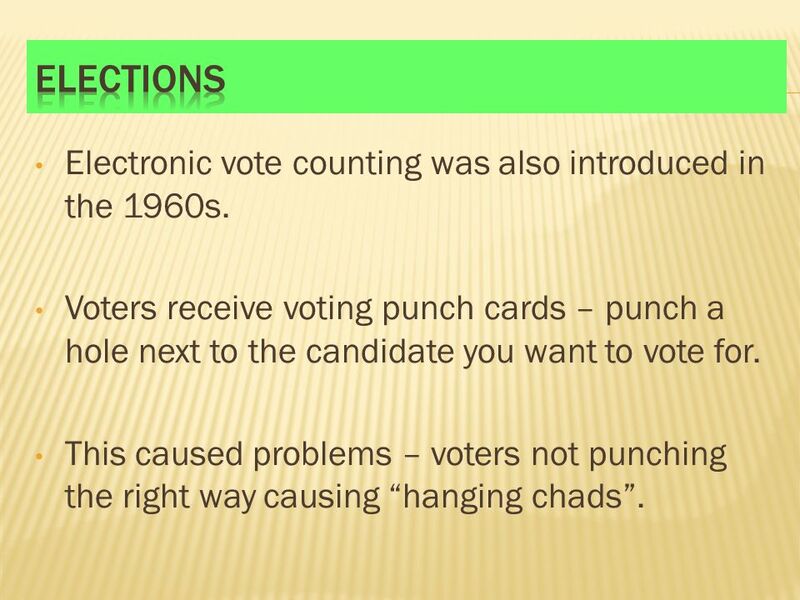 This caused problems – voters not punching the right way causing “hanging chads”. 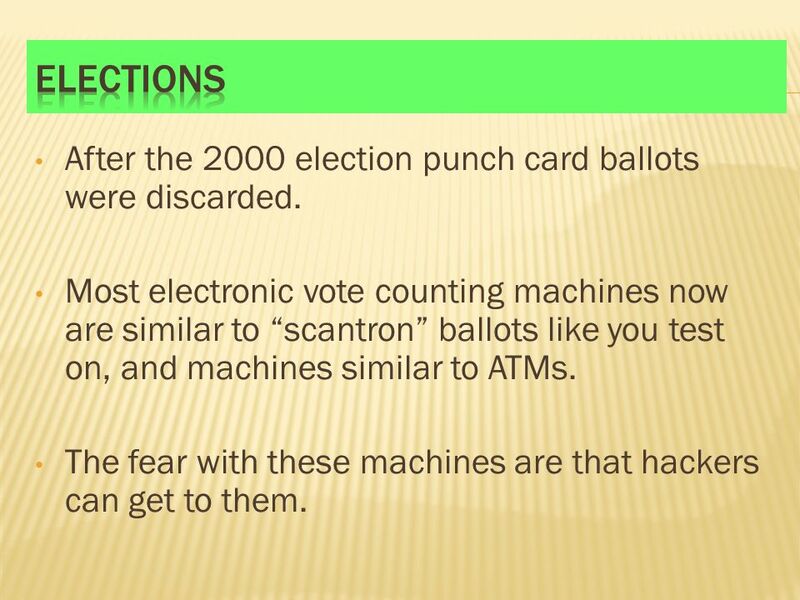 70 Elections After the 2000 election punch card ballots were discarded. 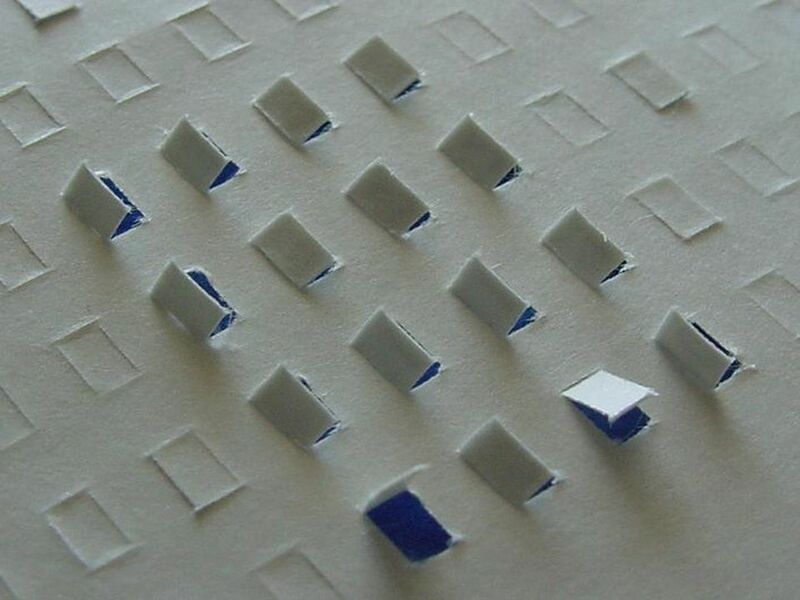 Most electronic vote counting machines now are similar to “scantron” ballots like you test on, and machines similar to ATMs. The fear with these machines are that hackers can get to them. 73 Elections A number of states conduct their elections by mail. 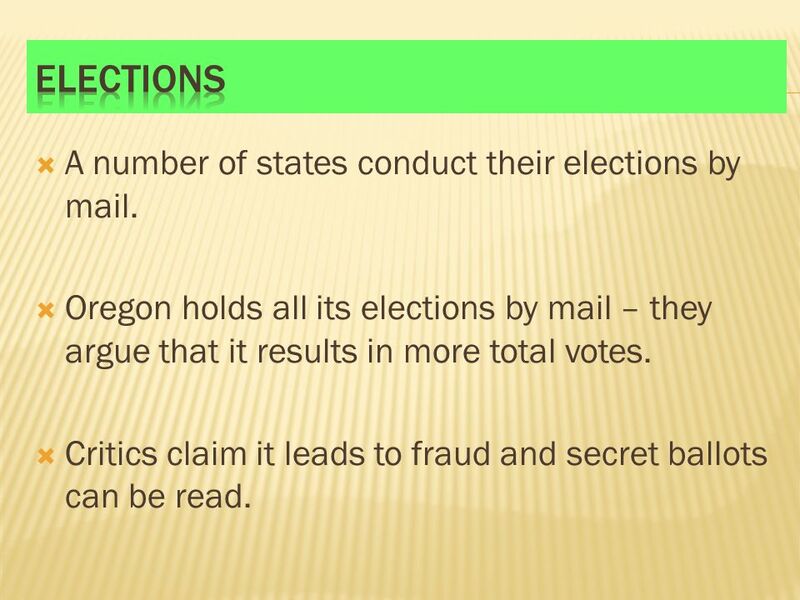 Oregon holds all its elections by mail – they argue that it results in more total votes. Critics claim it leads to fraud and secret ballots can be read. 74 Elections Many speculate that online voting will be the most widely used method in the future. 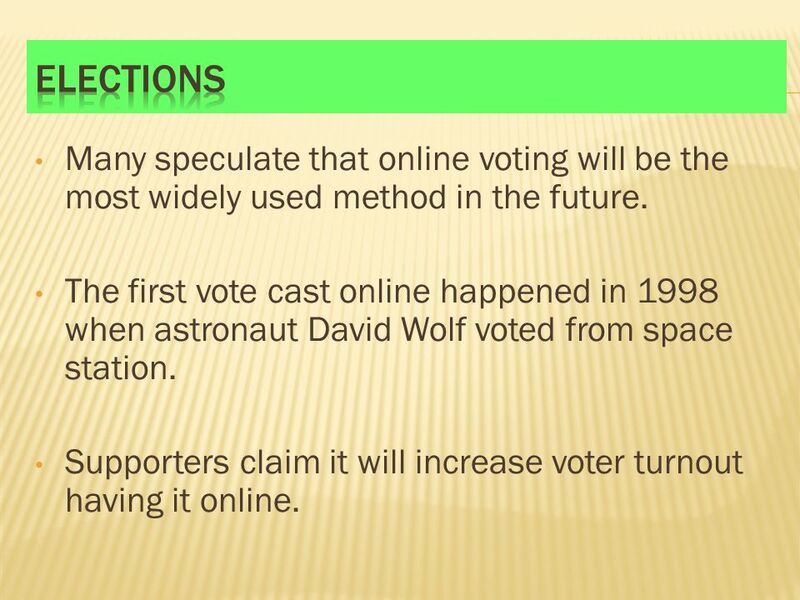 The first vote cast online happened in 1998 when astronaut David Wolf voted from space station. Supporters claim it will increase voter turnout having it online. 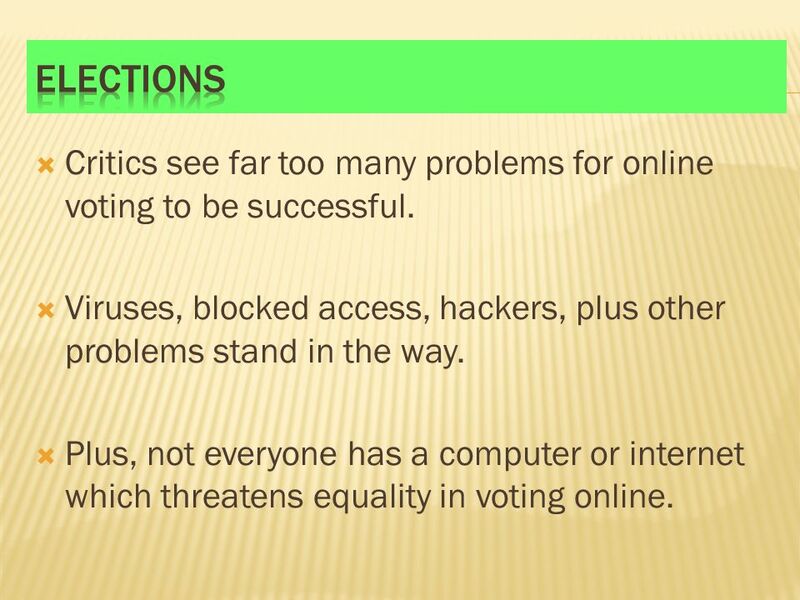 75 Elections Critics see far too many problems for online voting to be successful. Viruses, blocked access, hackers, plus other problems stand in the way. Plus, not everyone has a computer or internet which threatens equality in voting online. 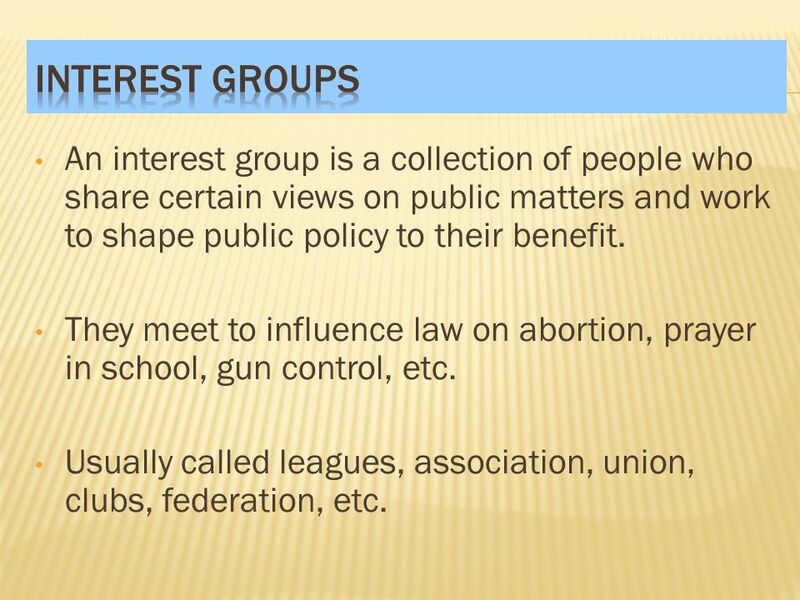 77 Interest Groups An interest group is a collection of people who share certain views on public matters and work to shape public policy to their benefit. They meet to influence law on abortion, prayer in school, gun control, etc. Usually called leagues, association, union, clubs, federation, etc. 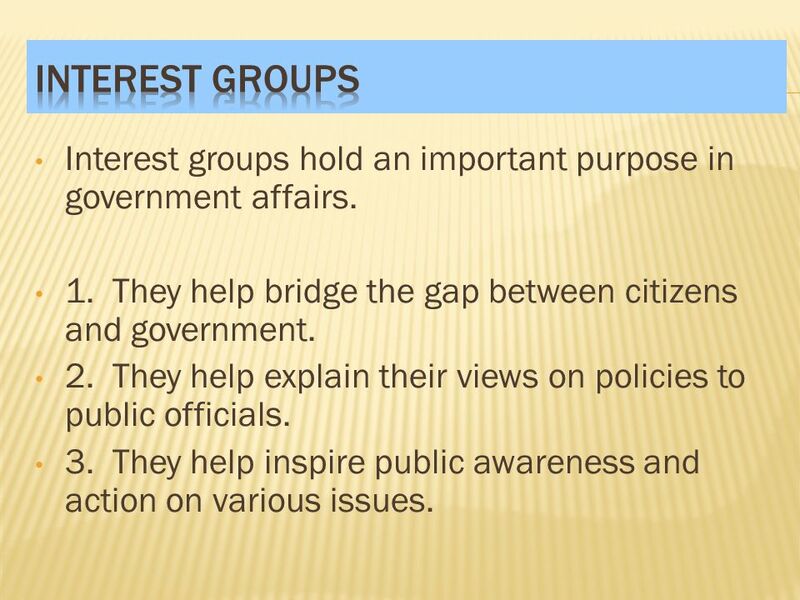 78 Interest Groups Interest groups hold an important purpose in government affairs. 1. They help bridge the gap between citizens and government. 2. They help explain their views on policies to public officials. 3. They help inspire public awareness and action on various issues. 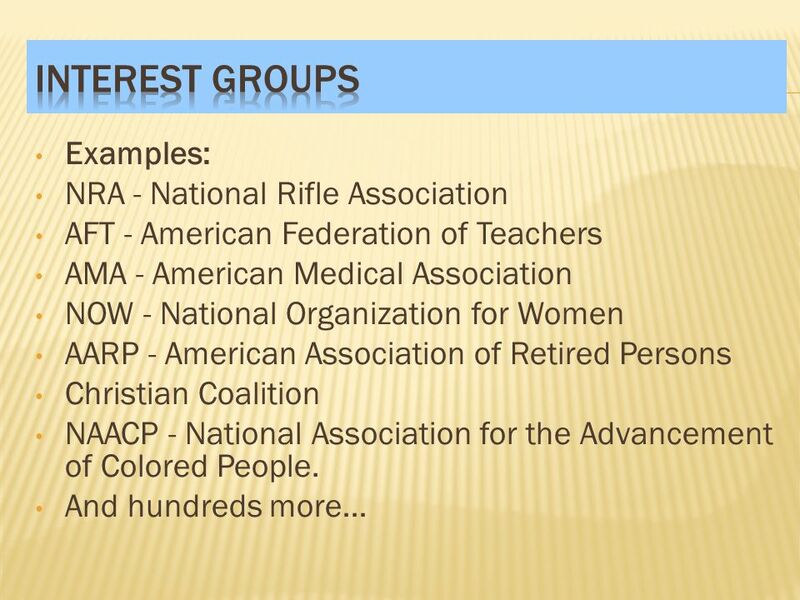 79 Interest Groups Interest groups are similar to political parties in that they are made up of like minded individuals trying to affect government. 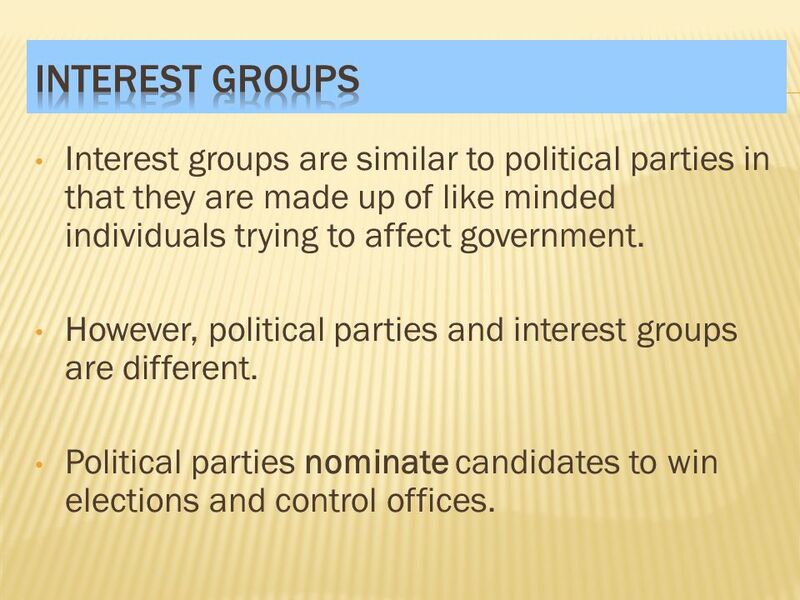 However, political parties and interest groups are different. Political parties nominate candidates to win elections and control offices. 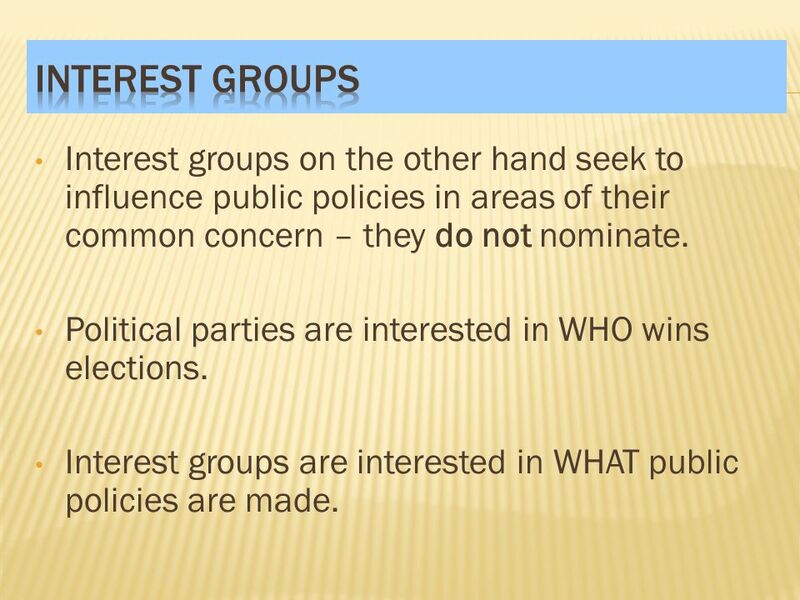 80 Interest Groups Interest groups on the other hand seek to influence public policies in areas of their common concern – they do not nominate. Political parties are interested in WHO wins elections. Interest groups are interested in WHAT public policies are made. 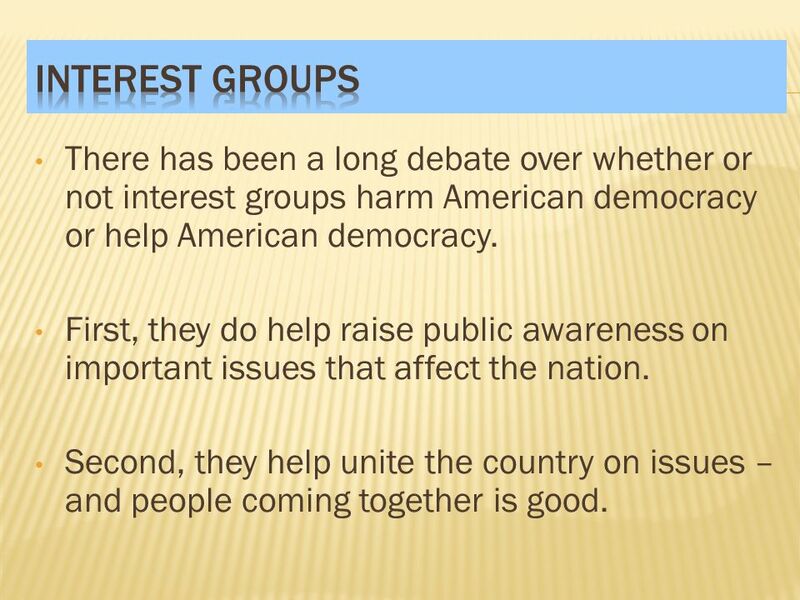 81 Interest Groups There has been a long debate over whether or not interest groups harm American democracy or help American democracy. First, they do help raise public awareness on important issues that affect the nation. Second, they help unite the country on issues – and people coming together is good. 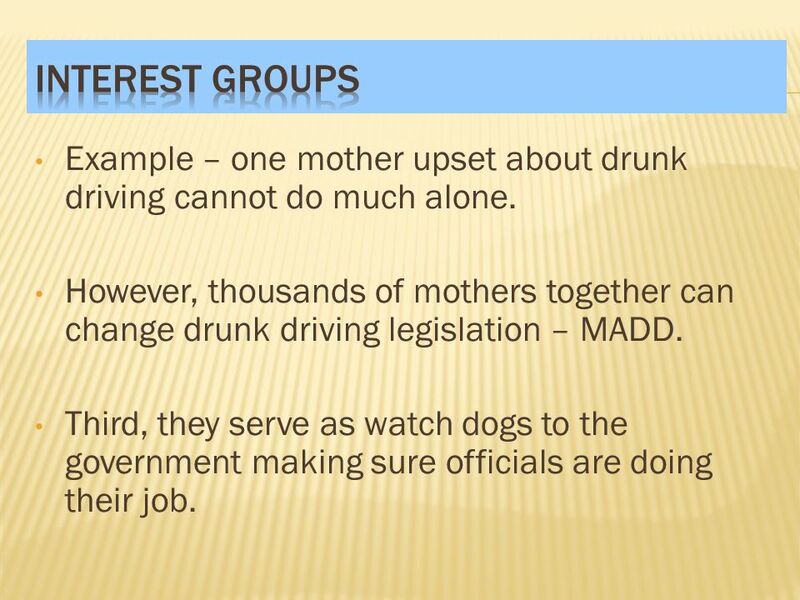 82 Interest Groups Example – one mother upset about drunk driving cannot do much alone. However, thousands of mothers together can change drunk driving legislation – MADD. Third, they serve as watch dogs to the government making sure officials are doing their job. 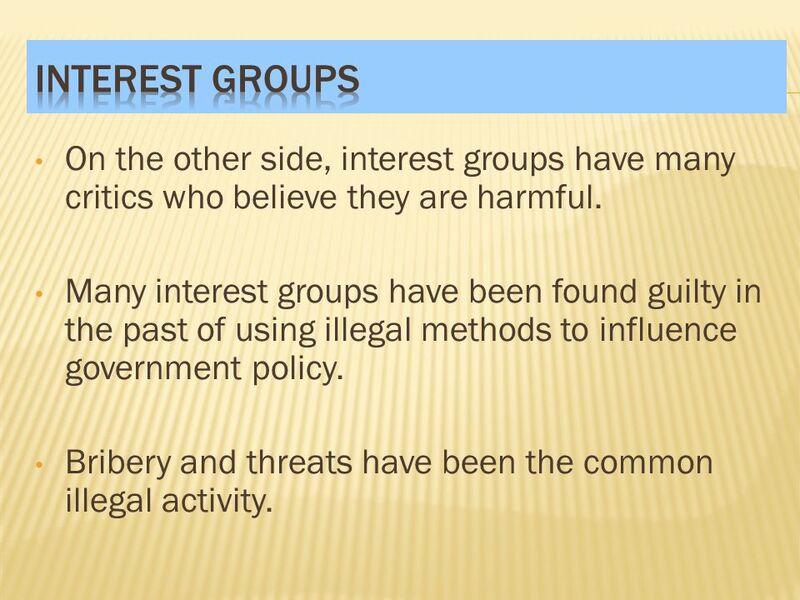 83 Interest Groups On the other side, interest groups have many critics who believe they are harmful. Many interest groups have been found guilty in the past of using illegal methods to influence government policy. Bribery and threats have been the common illegal activity. 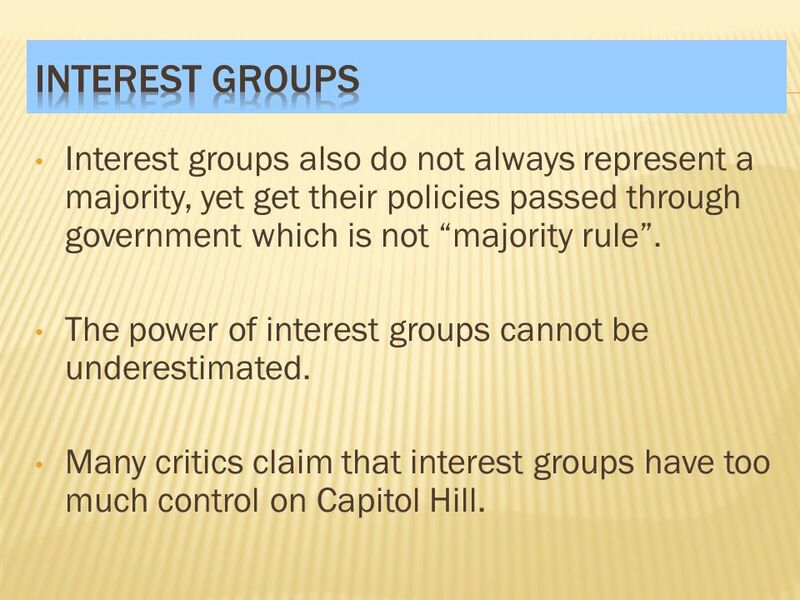 84 Interest Groups Interest groups also do not always represent a majority, yet get their policies passed through government which is not “majority rule”. The power of interest groups cannot be underestimated. 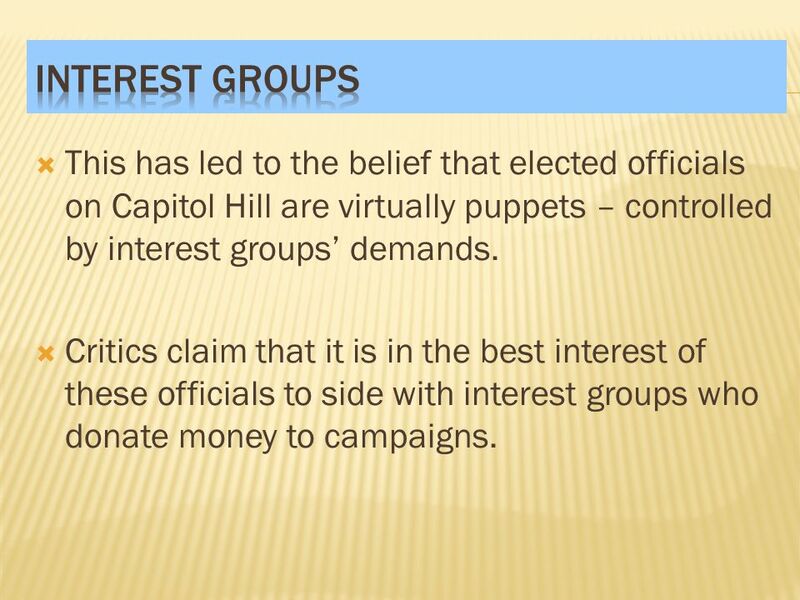 Many critics claim that interest groups have too much control on Capitol Hill. 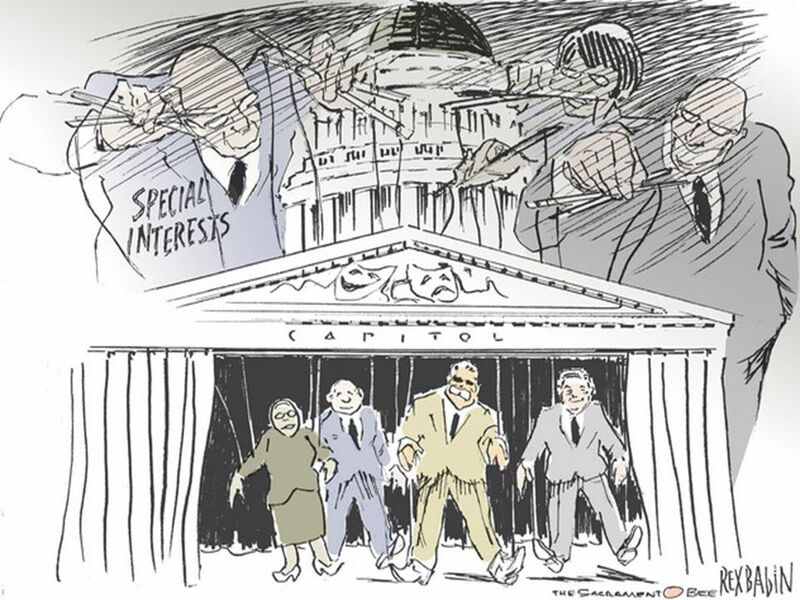 86 Interest Groups This has led to the belief that elected officials on Capitol Hill are virtually puppets – controlled by interest groups’ demands. 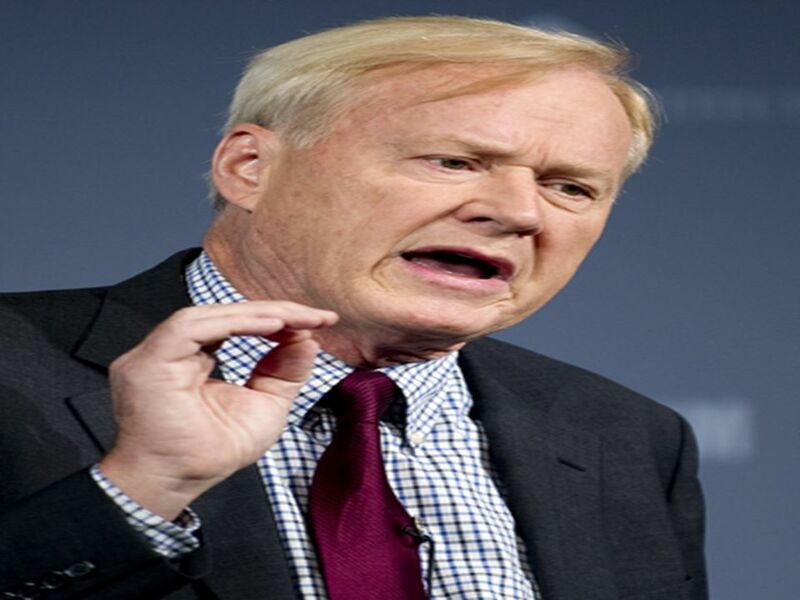 Critics claim that it is in the best interest of these officials to side with interest groups who donate money to campaigns. 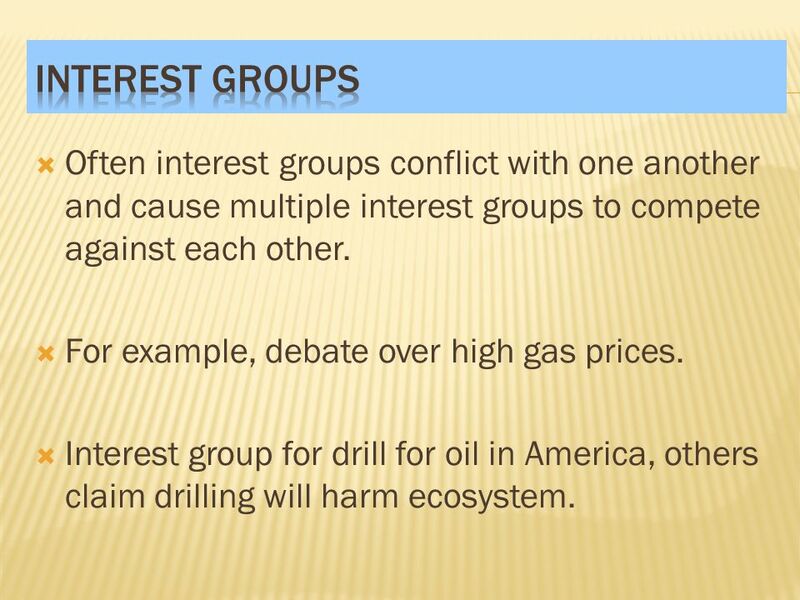 87 Interest Groups Often interest groups conflict with one another and cause multiple interest groups to compete against each other. For example, debate over high gas prices. Interest group for drill for oil in America, others claim drilling will harm ecosystem. Chapter 6 VOTERS AND VOTER BEHAVIOR.  1- Voting rights came in the 1800’s- Each state at a time eliminated property ownership and tax payment qualifications. Lesson Objectives: By the end of this lesson you will be able to: 1.Identify the universal qualifications for voting in the United States. 2.Explain the. The Electoral Process Chapter 7.  A group of persons who seek to control government through the winning of elections and the holding of public office. 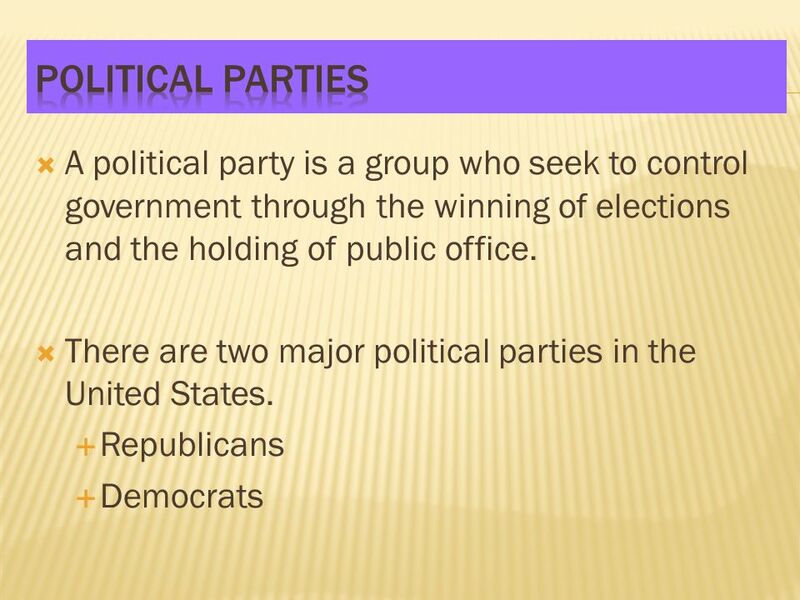 Question 1 Identify the two major political parties that represent the United States. A Two Party System Chapter 10 section 1 page 253. 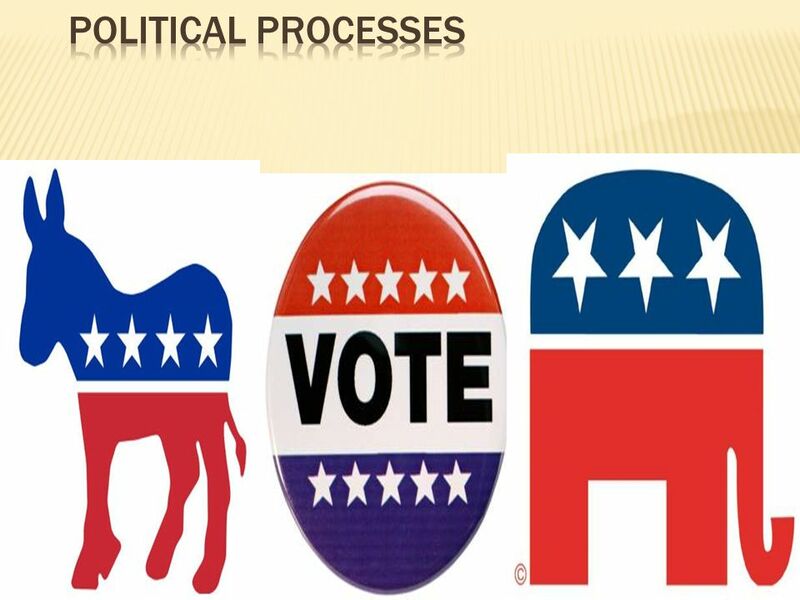 October 21, 2013 Objectives: Students will be able to define a political party, and the functions. What are the differences between a Democrat and Republican? Chapter 11 Voting & Elections. The Role of the Voter in Elections Text Chapter 6.